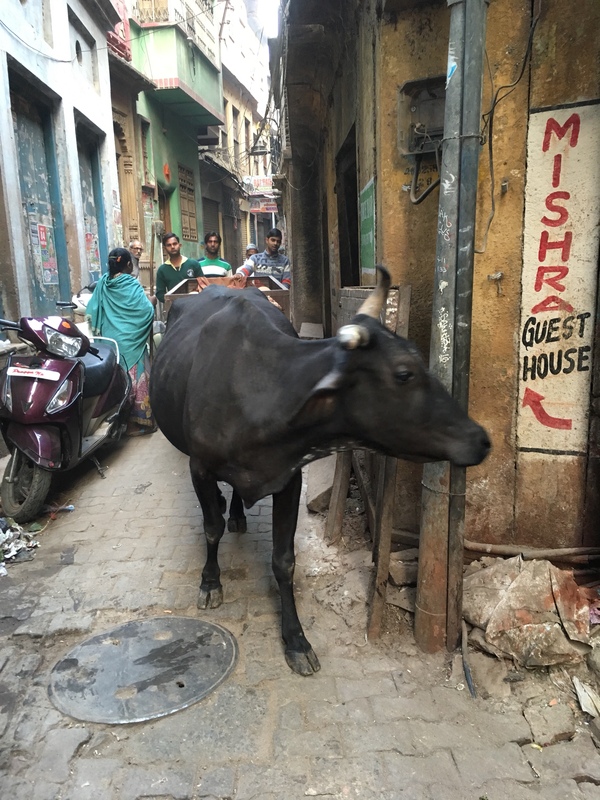 Where to begin with India?! 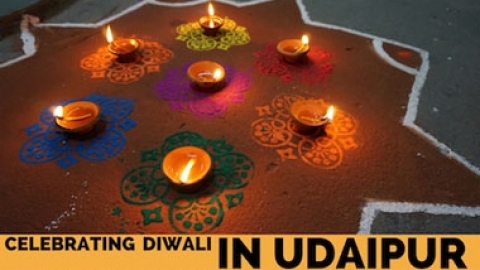 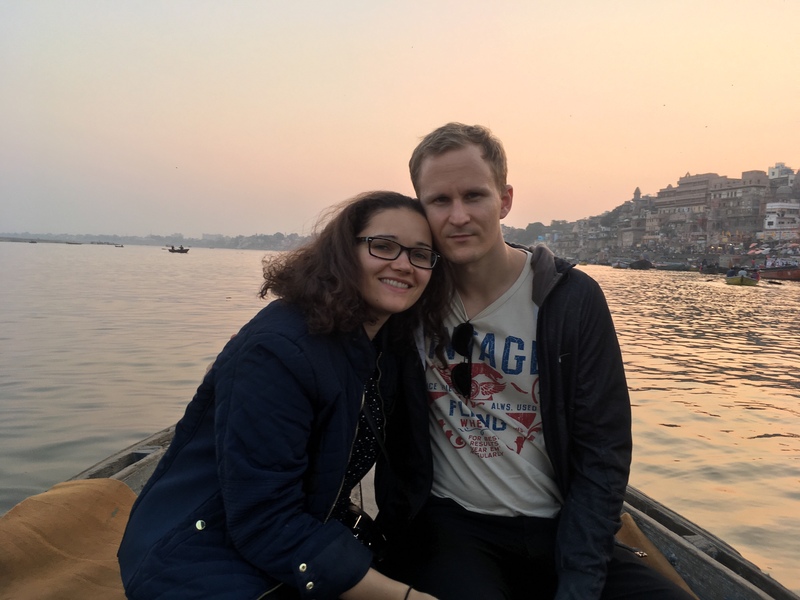 I had been wanting to go to India for a very long time, and finally we booked our trip (me and my boyfriend) for December. 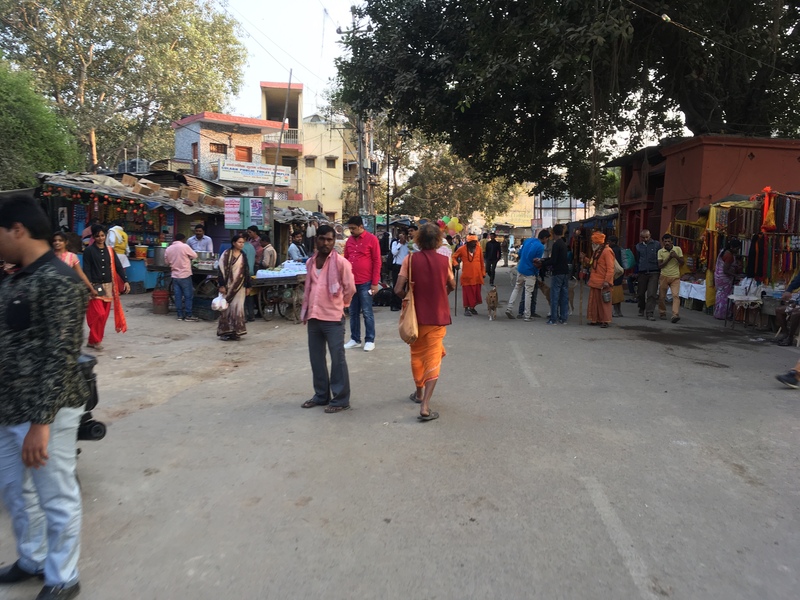 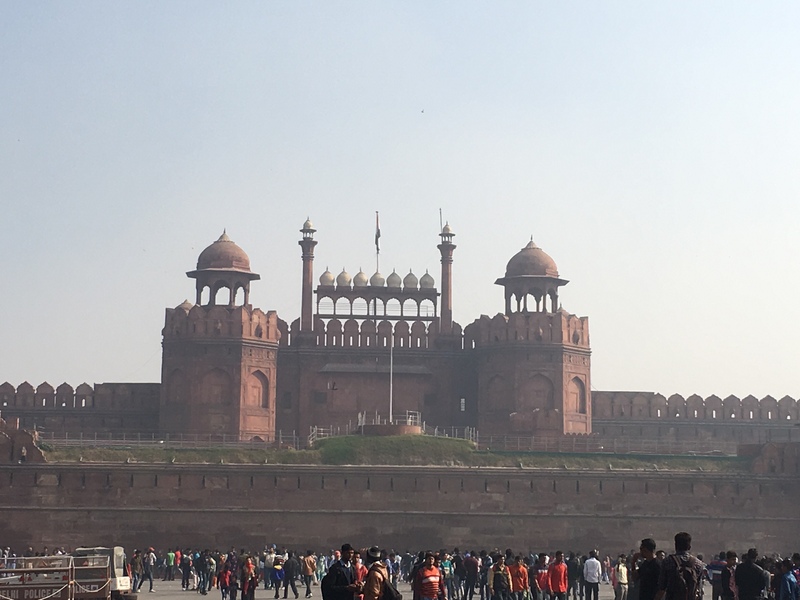 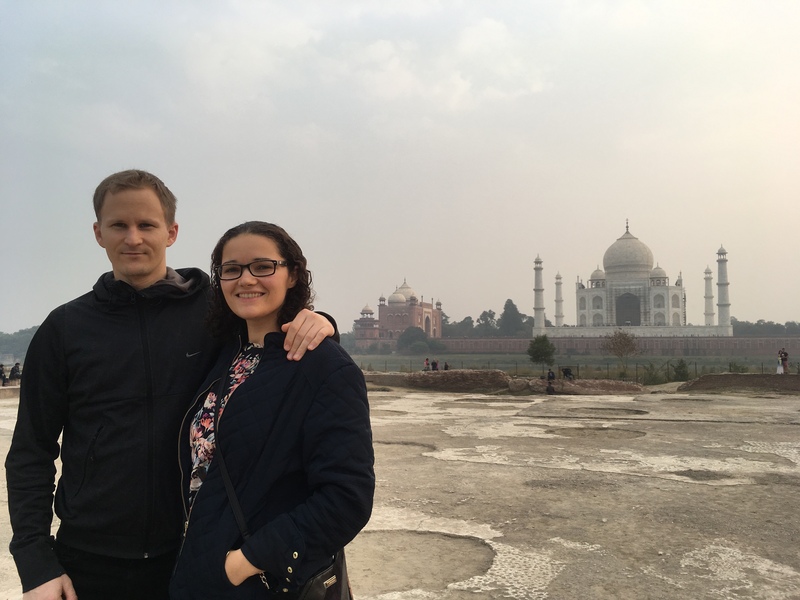 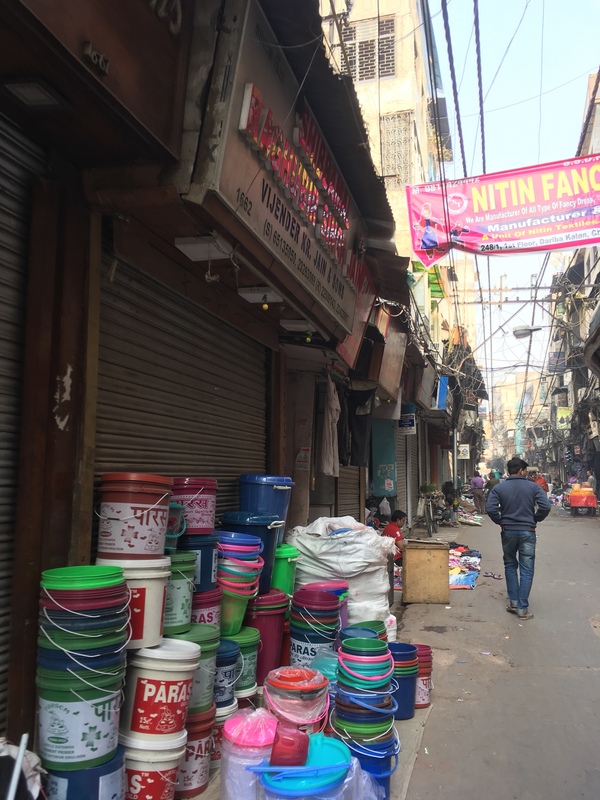 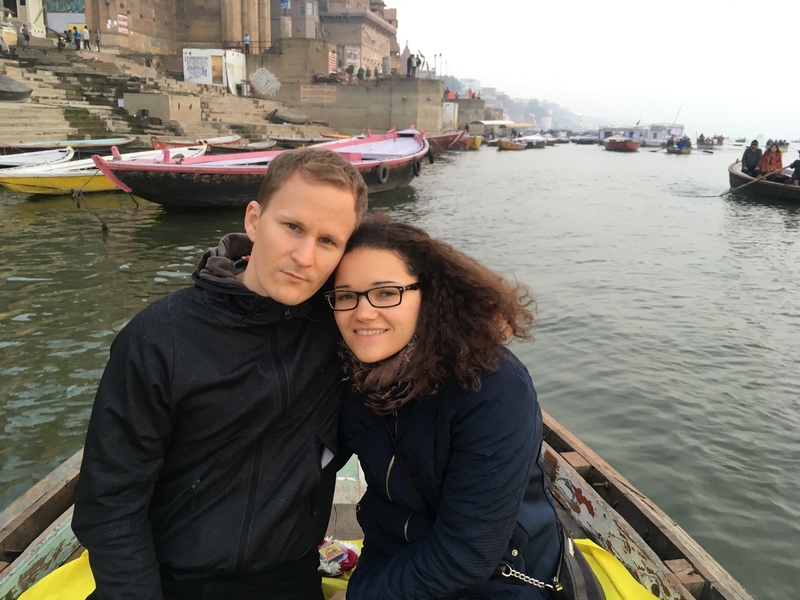 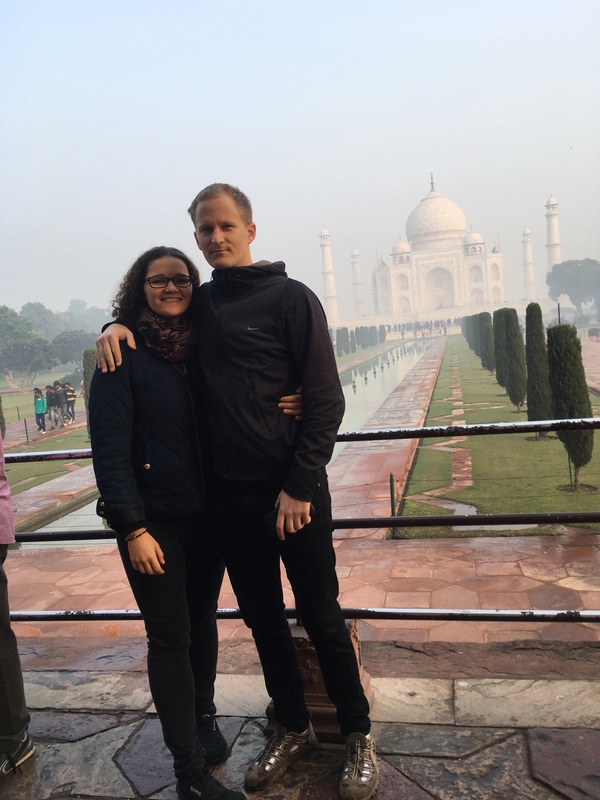 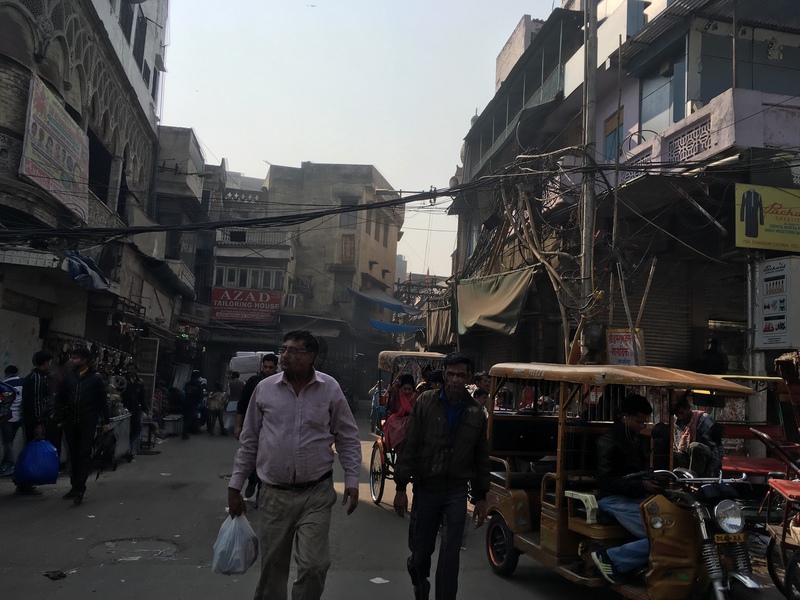 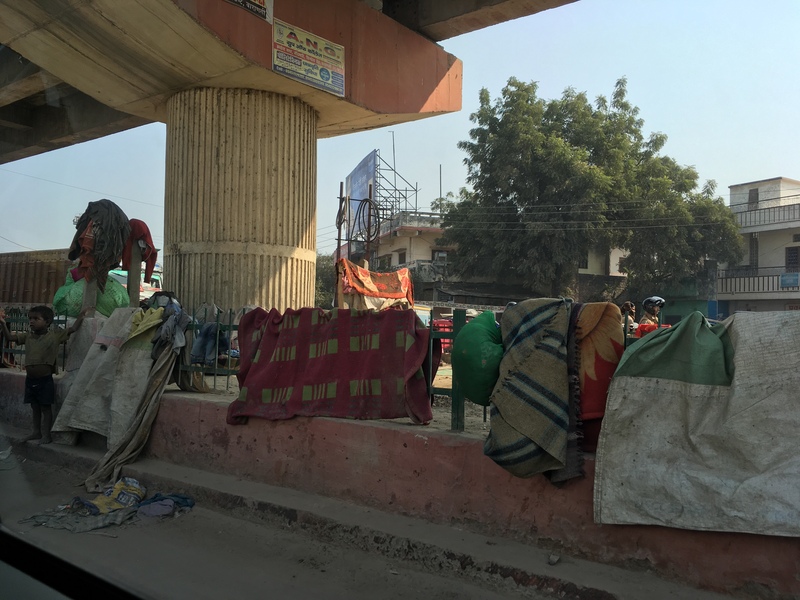 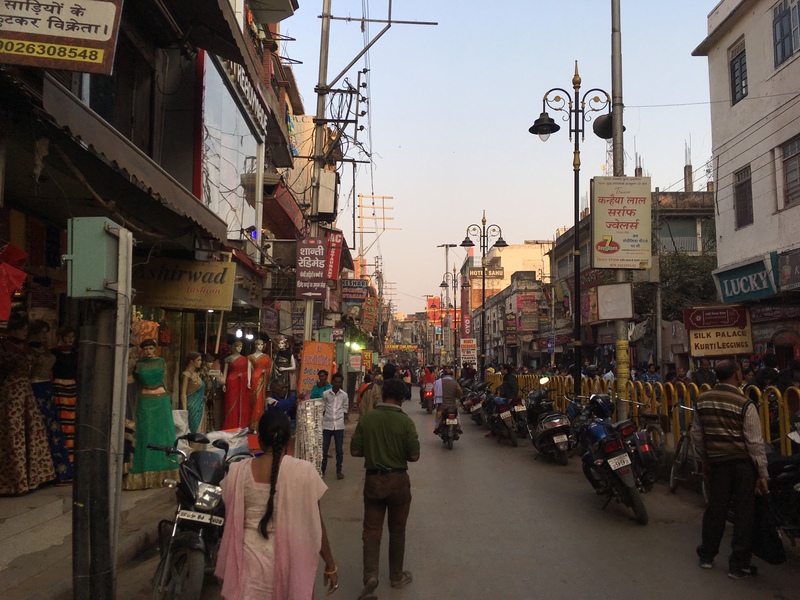 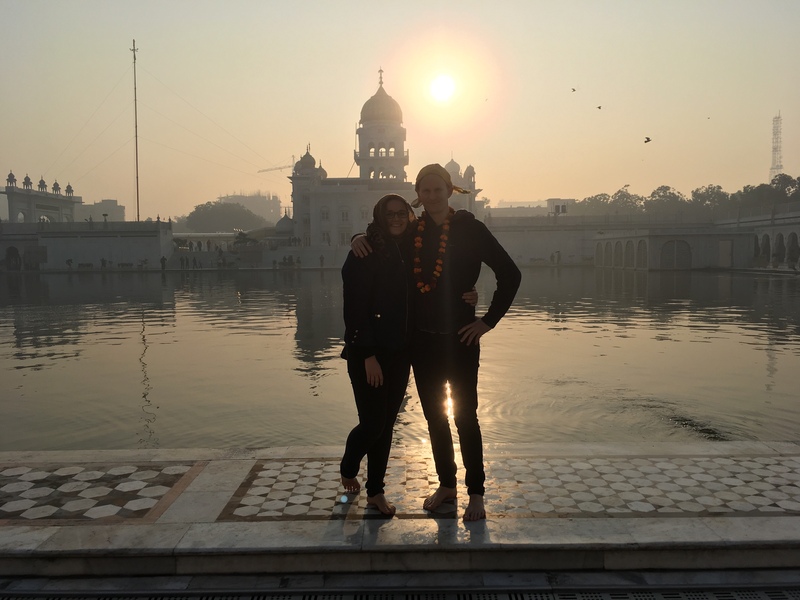 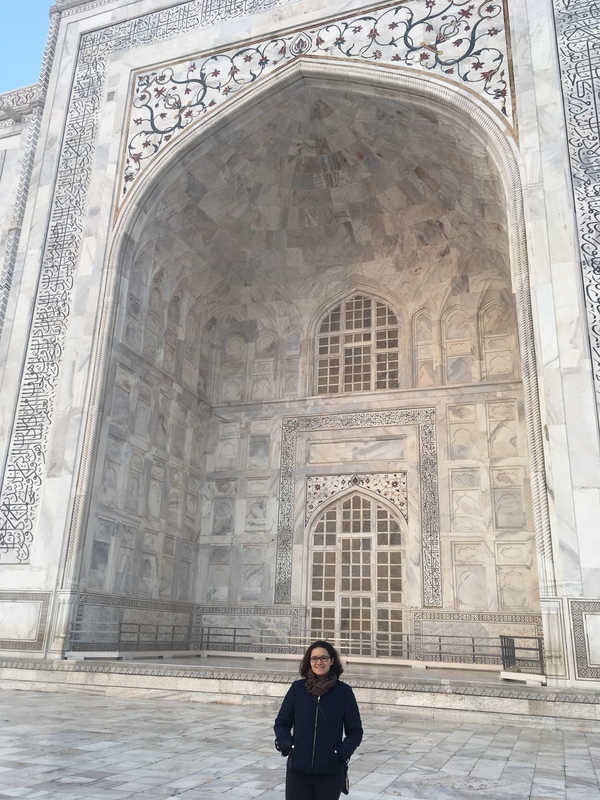 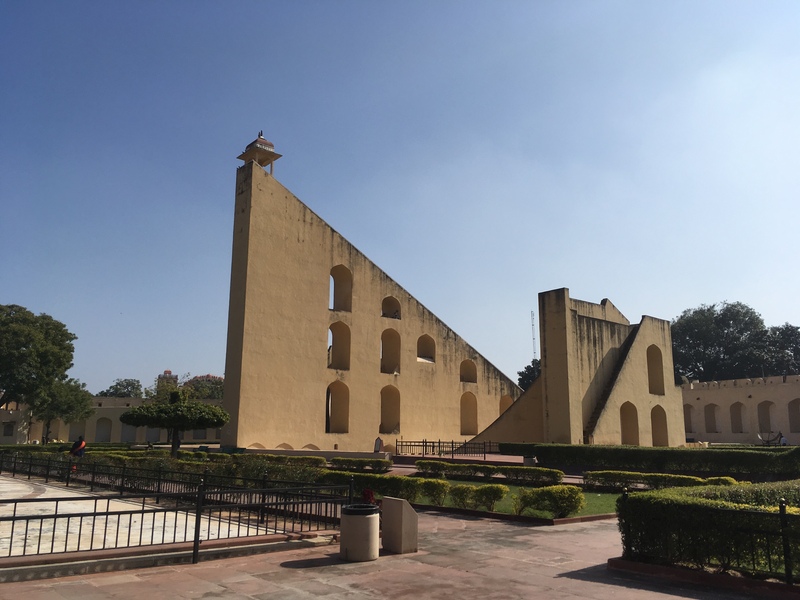 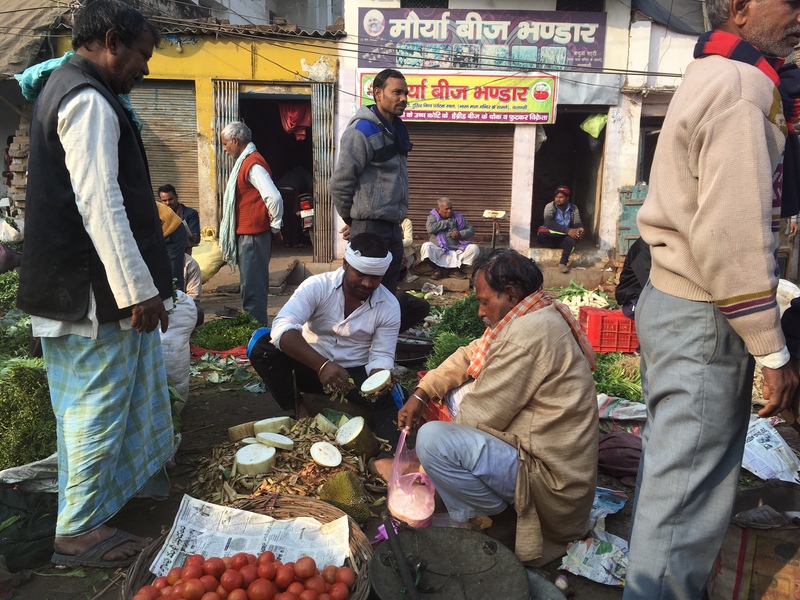 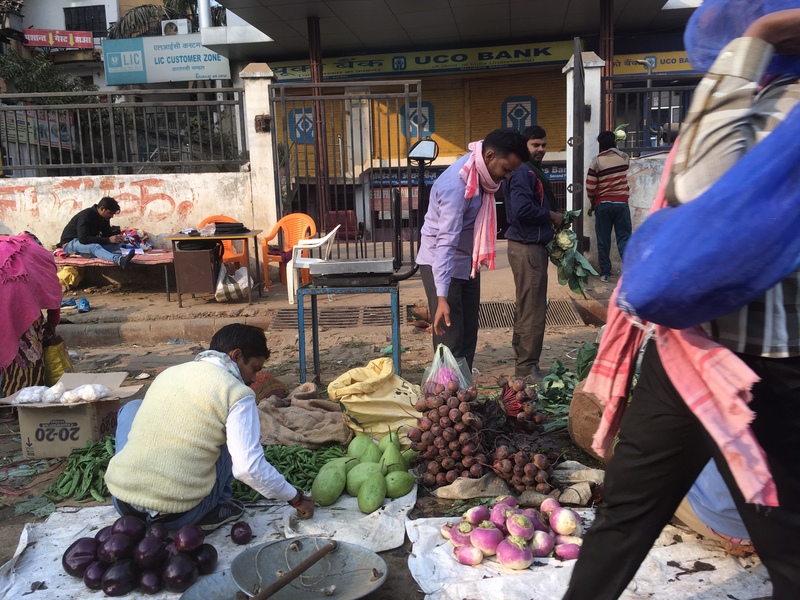 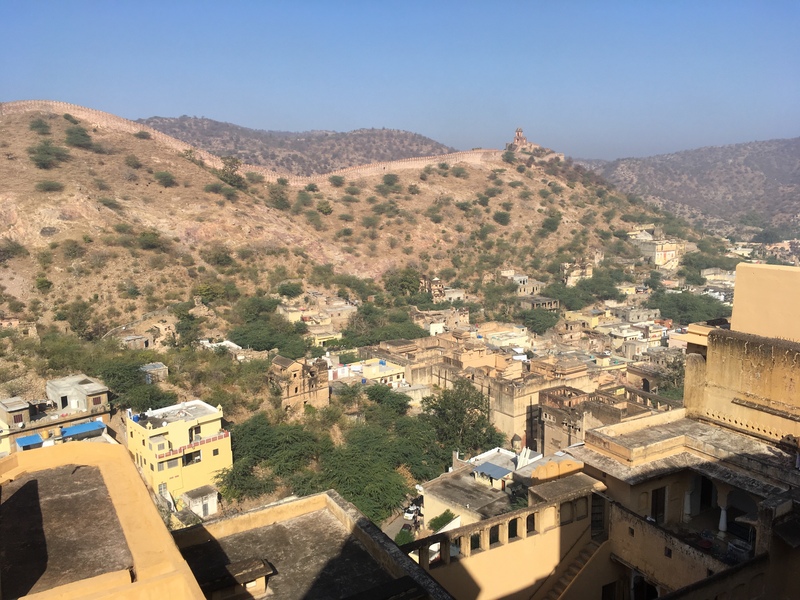 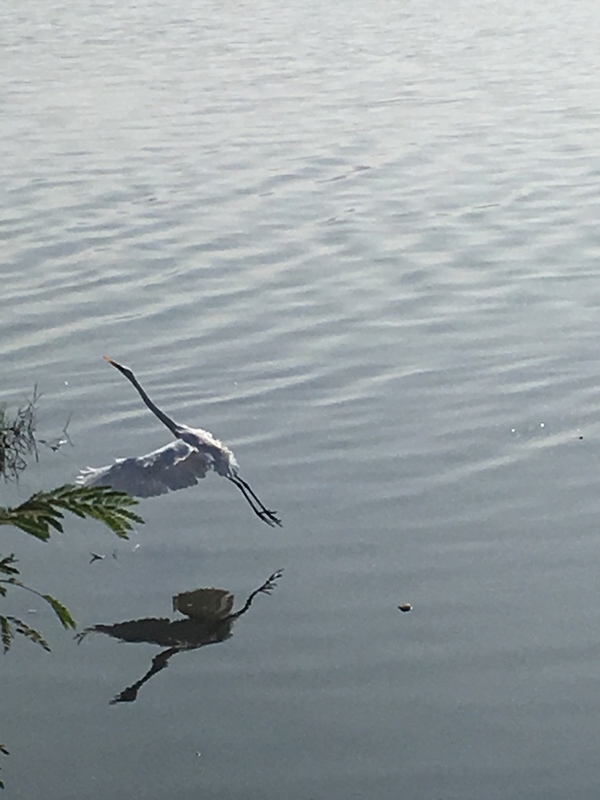 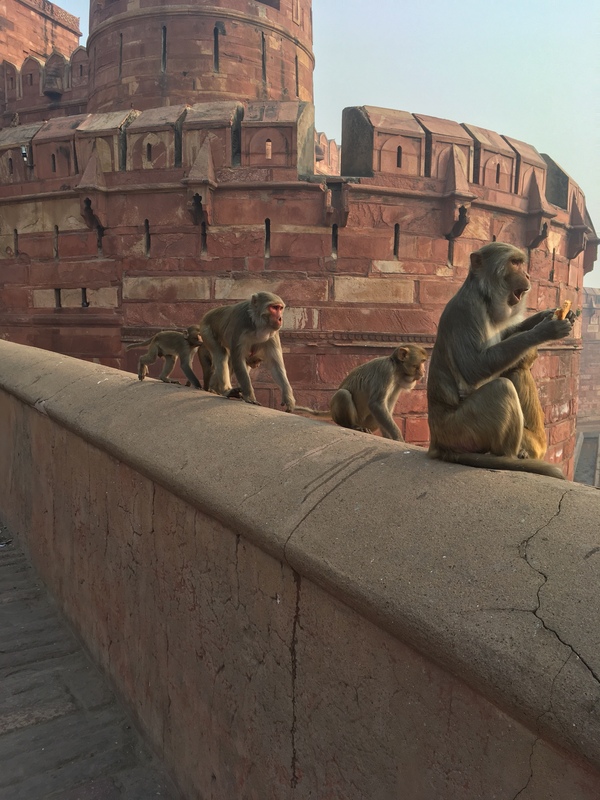 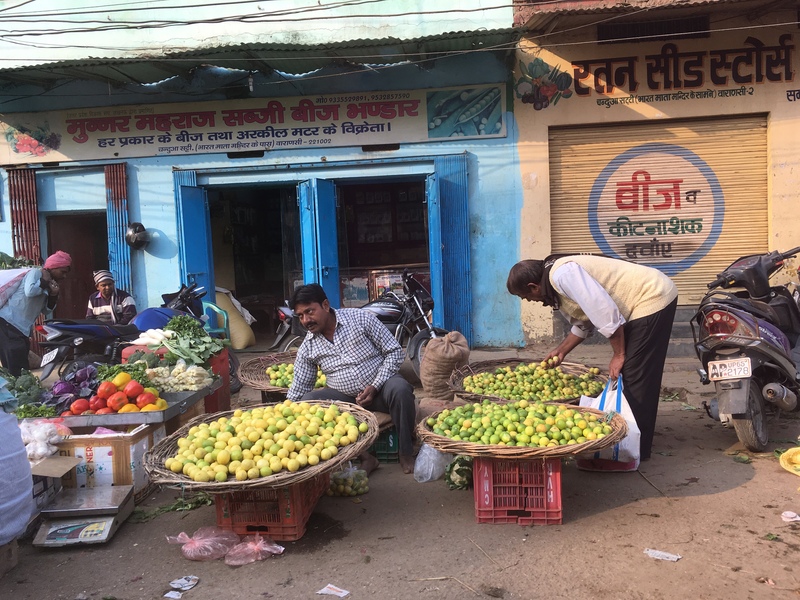 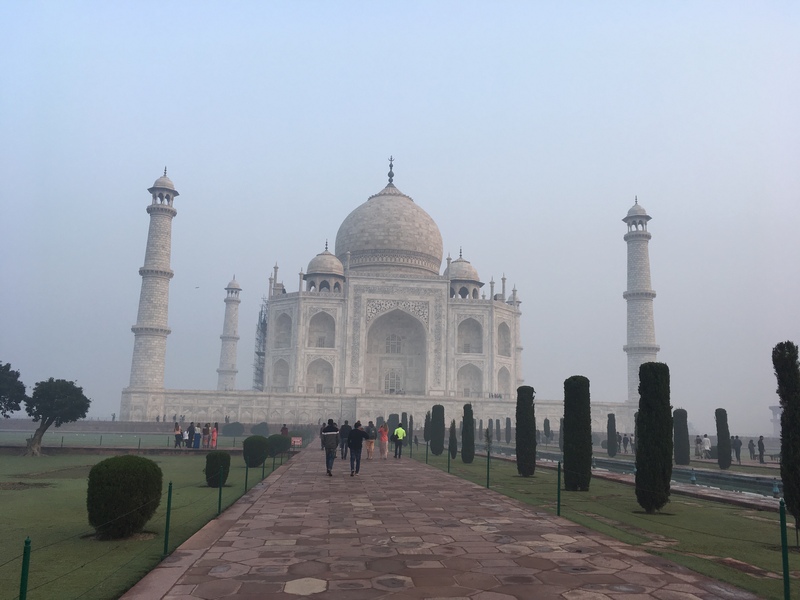 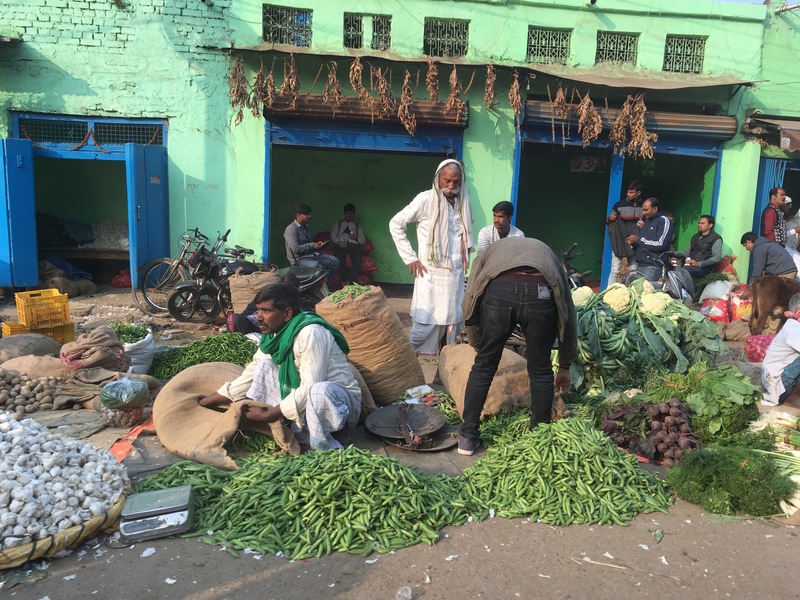 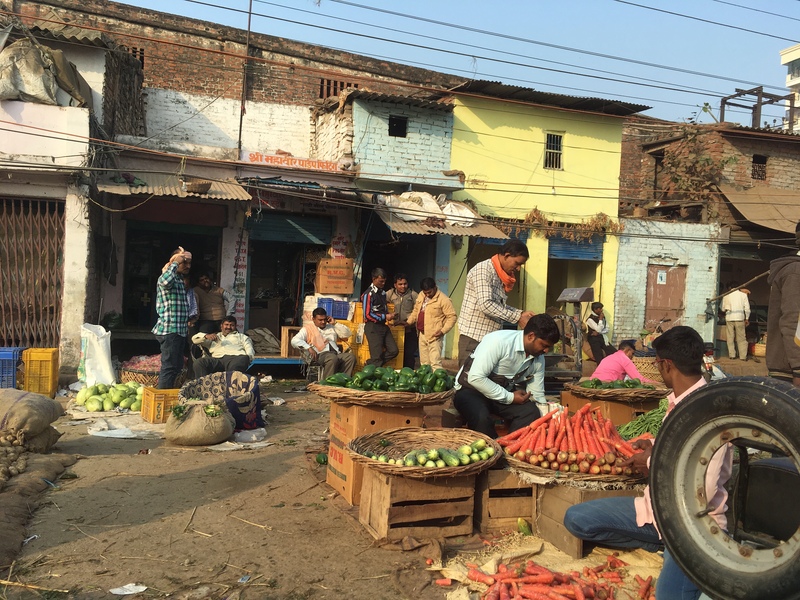 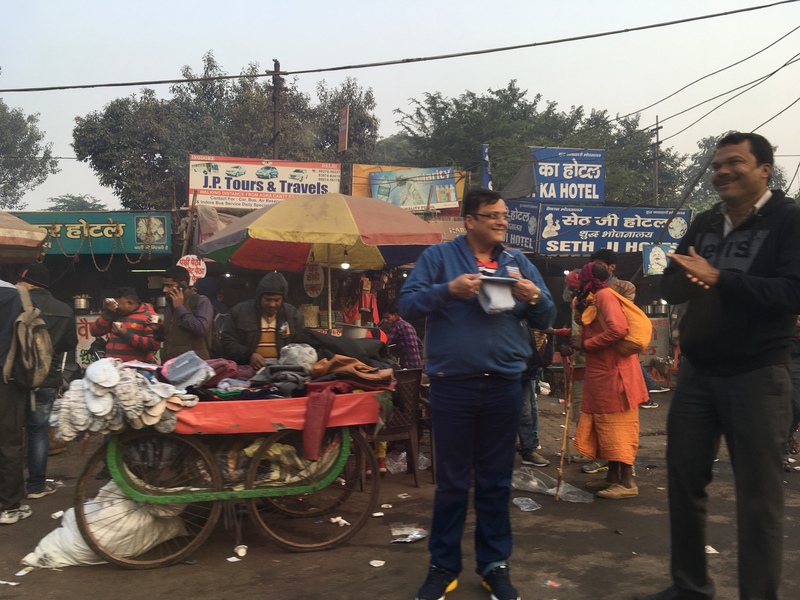 We visited Delhi, Agra, Taj Mahal, Jaipur and Varanasi. 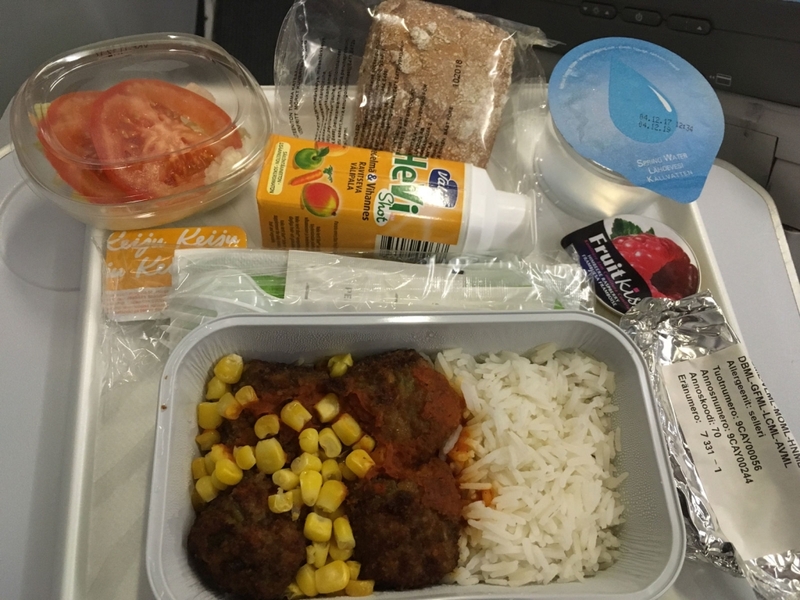 We flew with Finnair and the vegan meal was bean balls, sweetcorn, rice and salad, which was ok but the best bit was the fruit smoothie. 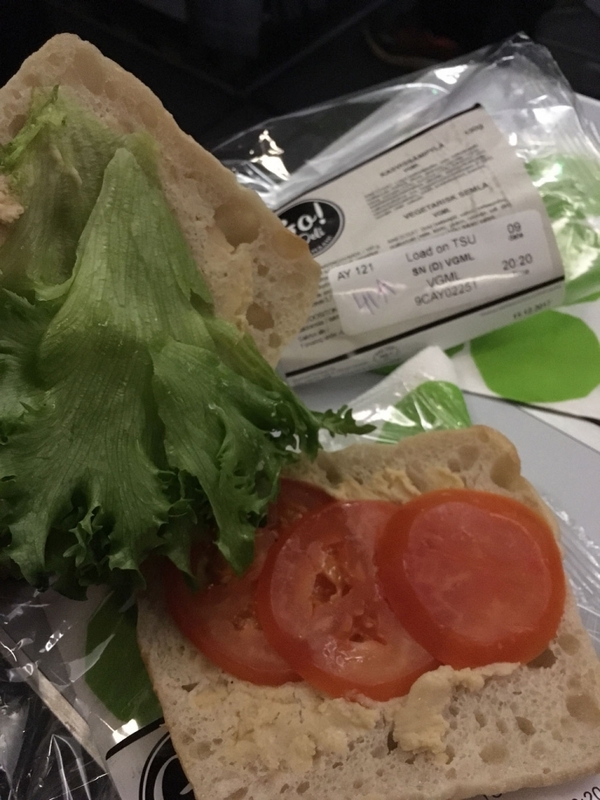 The snack was a hummus sandwich, which again was ok nothing special. 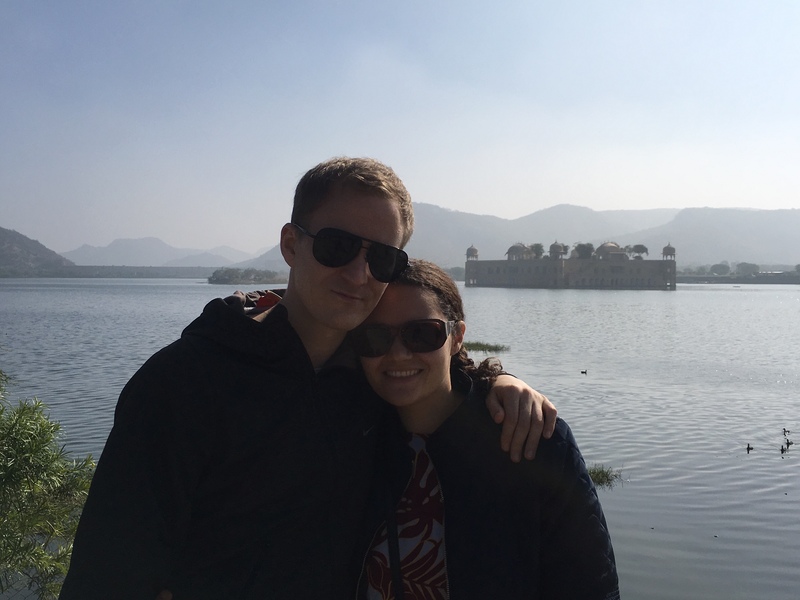 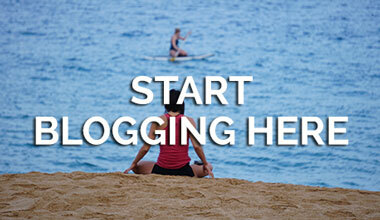 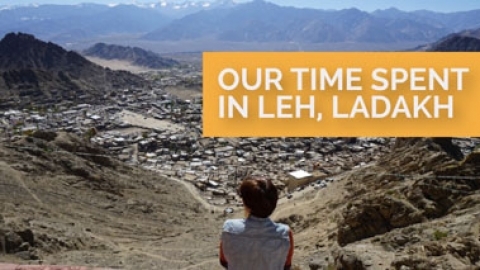 We booked a tour with Yolo India Tours and they were very good, they were quick in replying to emails. 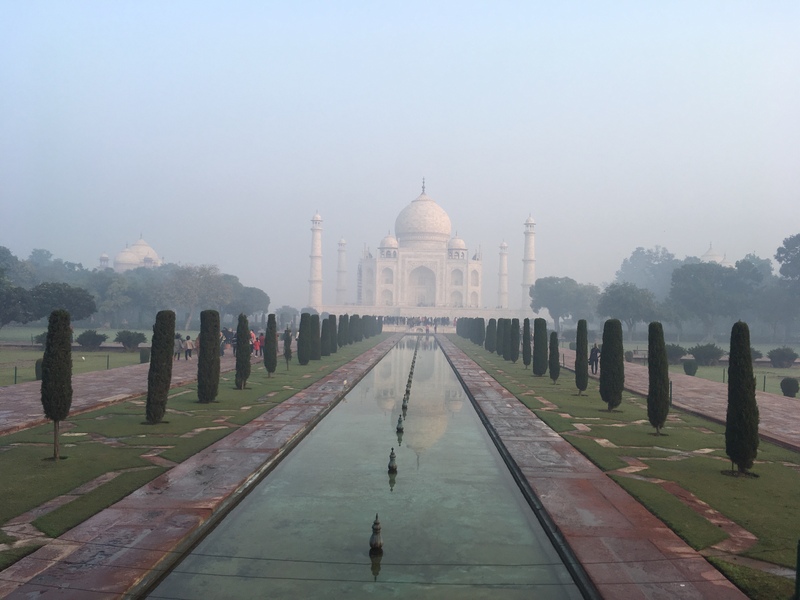 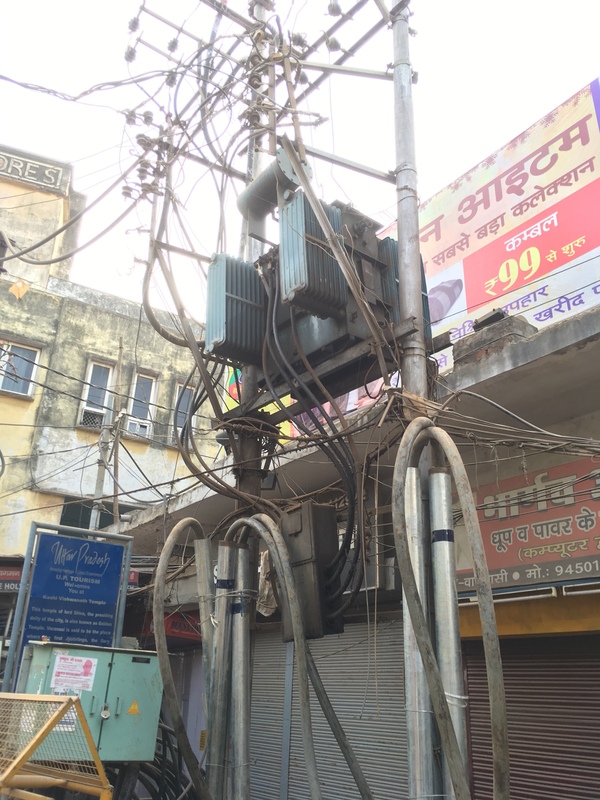 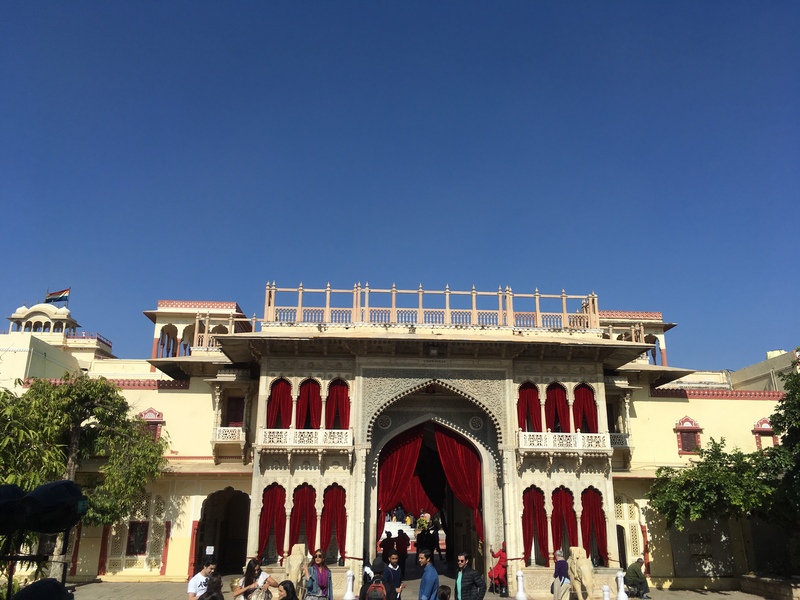 The choice of hotels were good in Agra, but not amazing in Delhi, Jaipur or Varanasi. 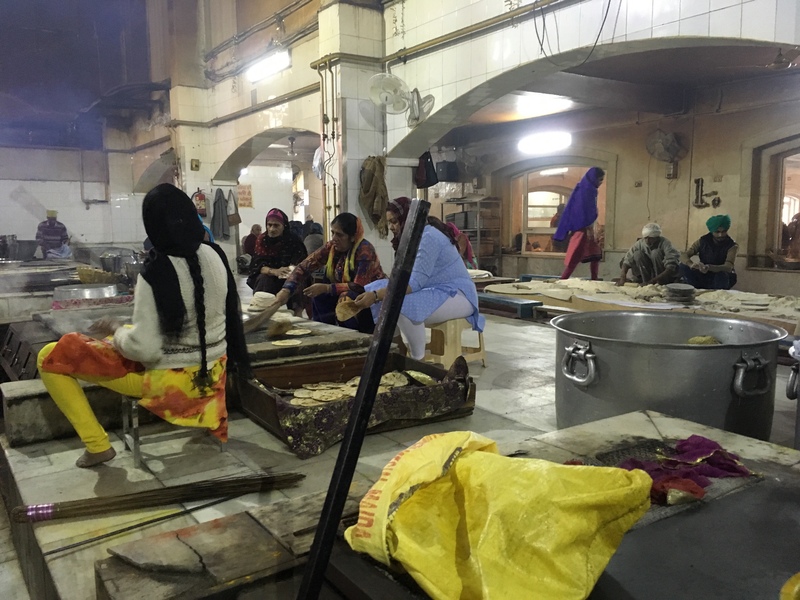 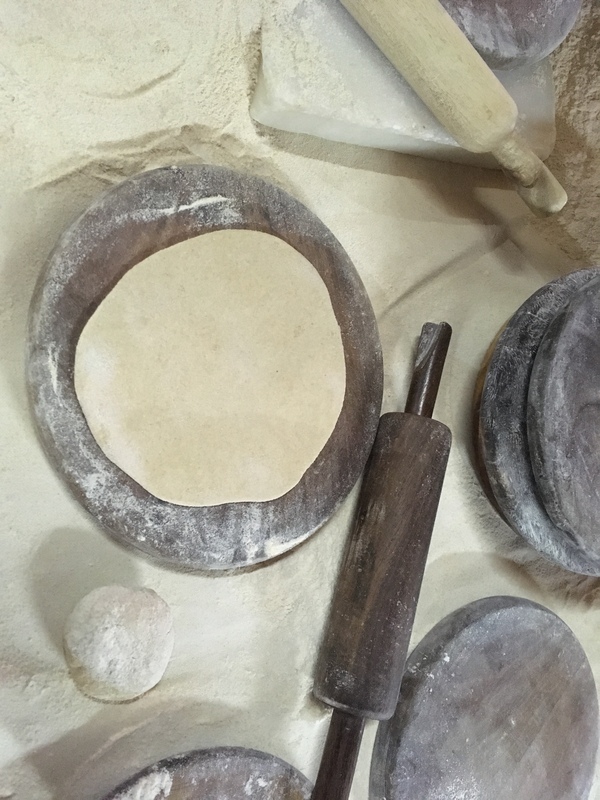 We visited a Hindu temple, where we got to visit the kitchens and help make roti. 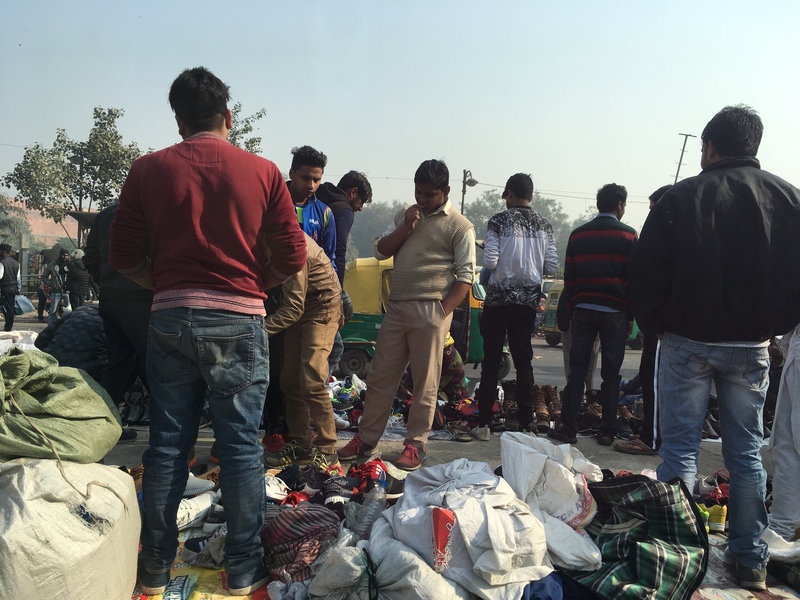 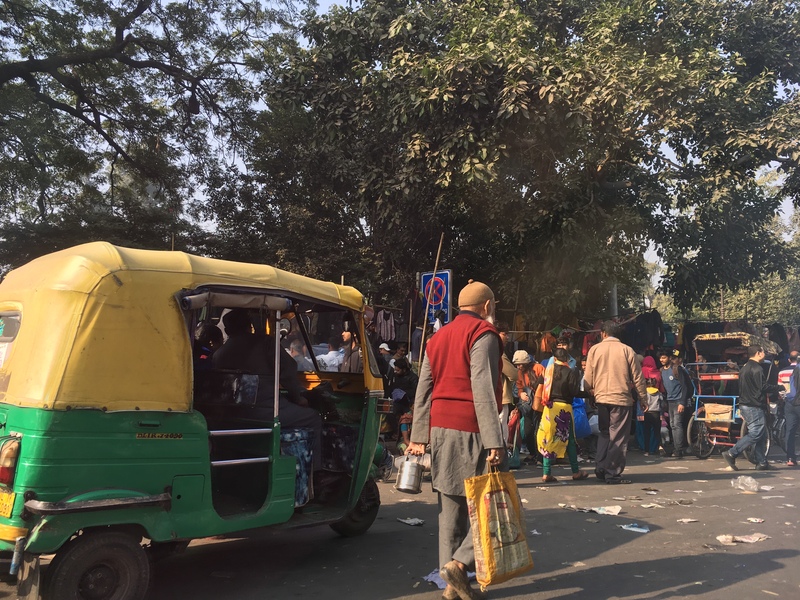 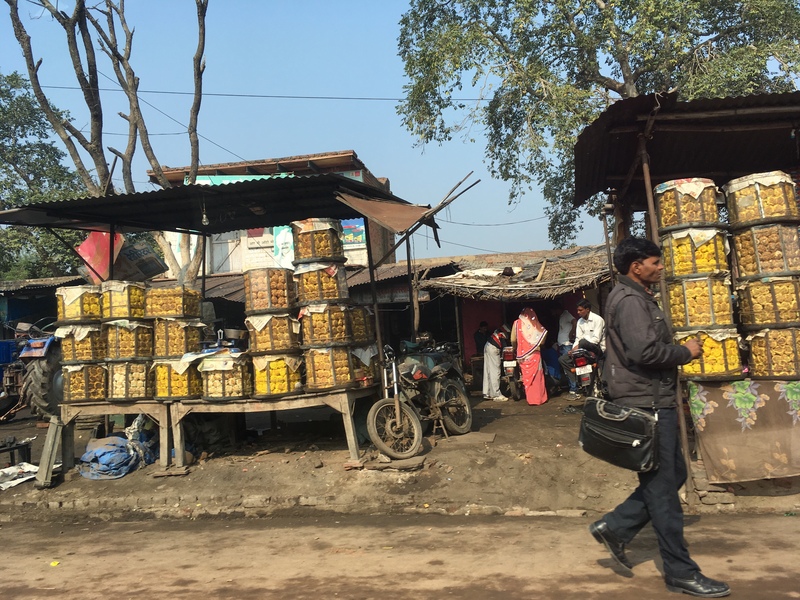 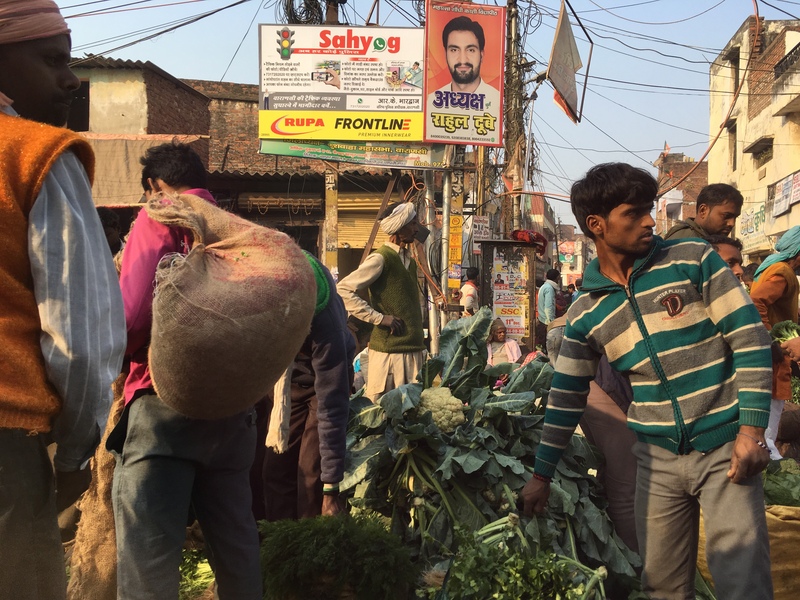 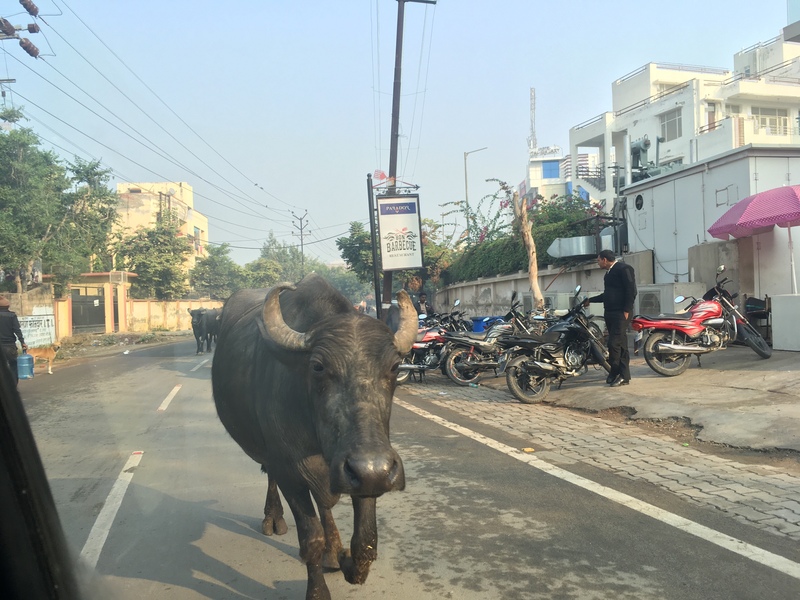 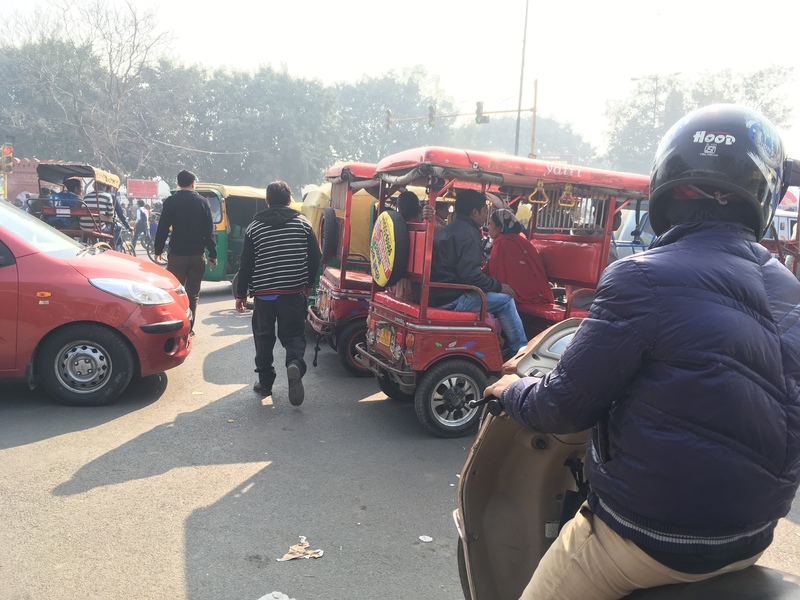 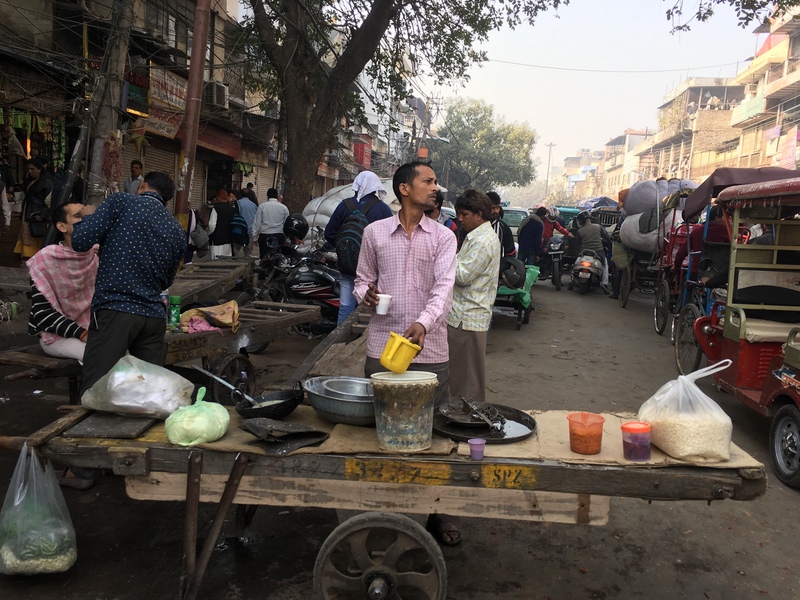 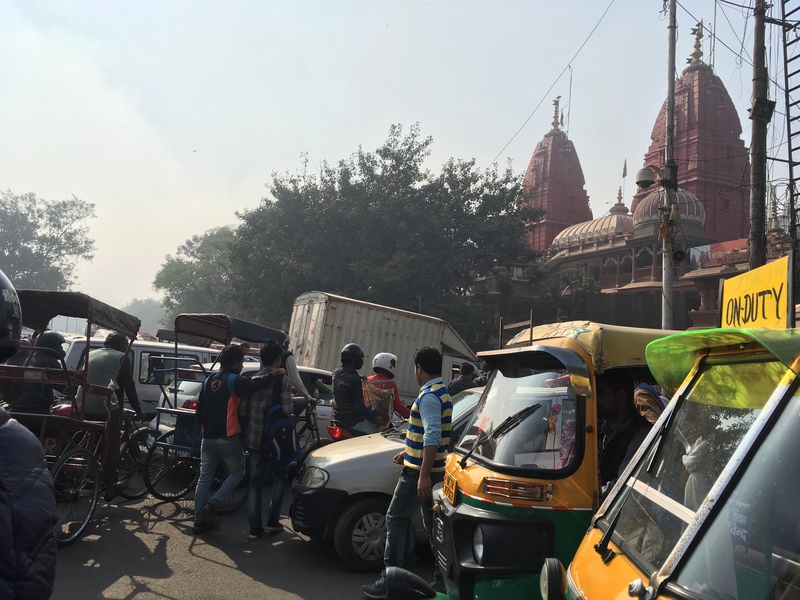 We visited Delhi and there are people, cars/motorbikes/tuk tuks and animals everywhere. 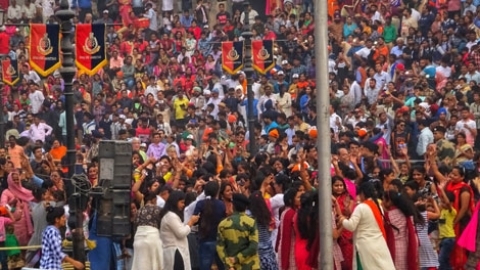 The noise and population is something I will remember for a long time! 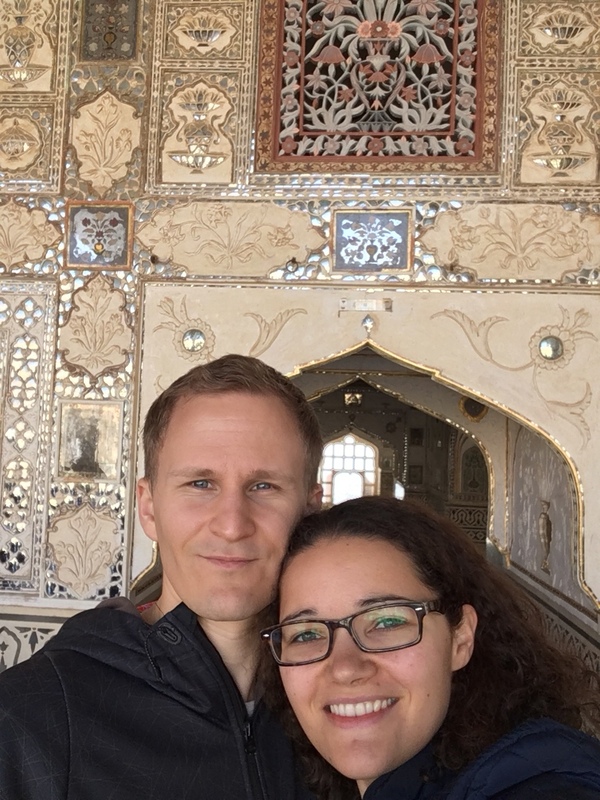 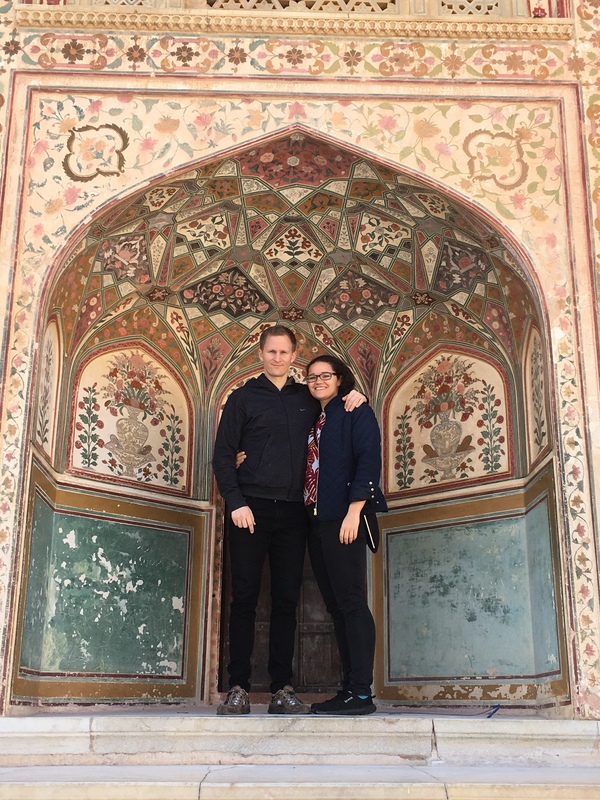 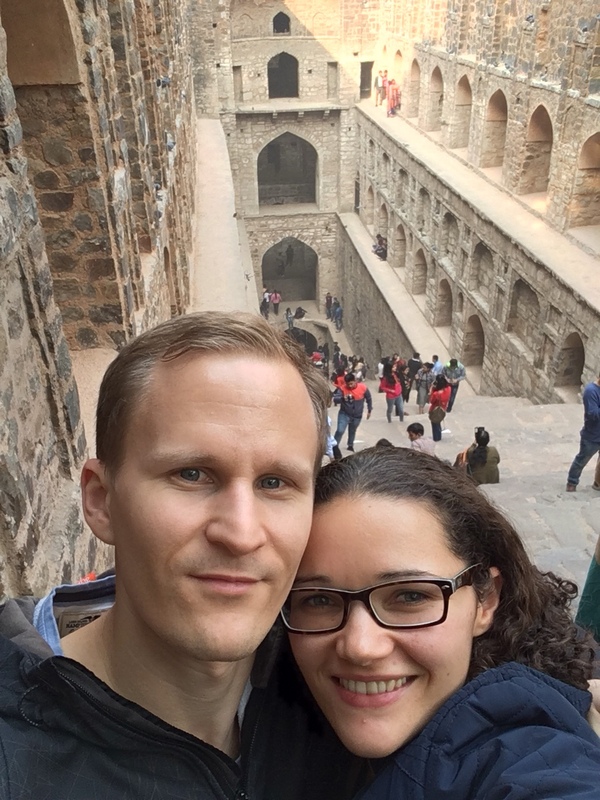 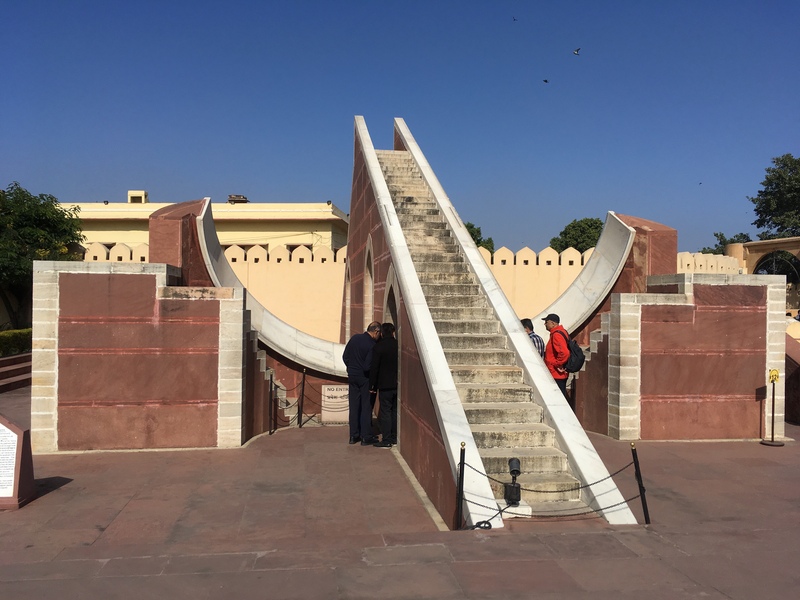 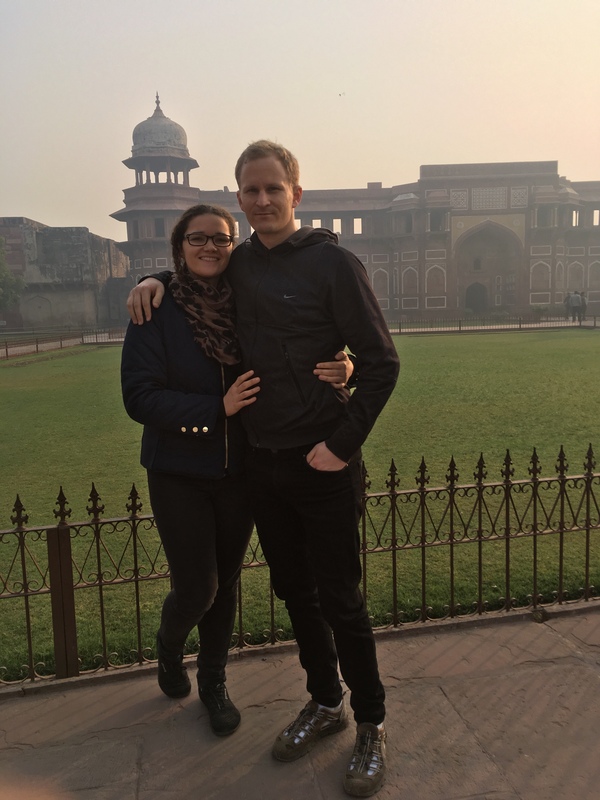 We saw the Red Fort, Jama Masjid, Chandni Chowk (market area), Ghandhi’s memorial, India Gate, Presidential Palace, Agrasen ki Baoli (step well used in Bollywood films). 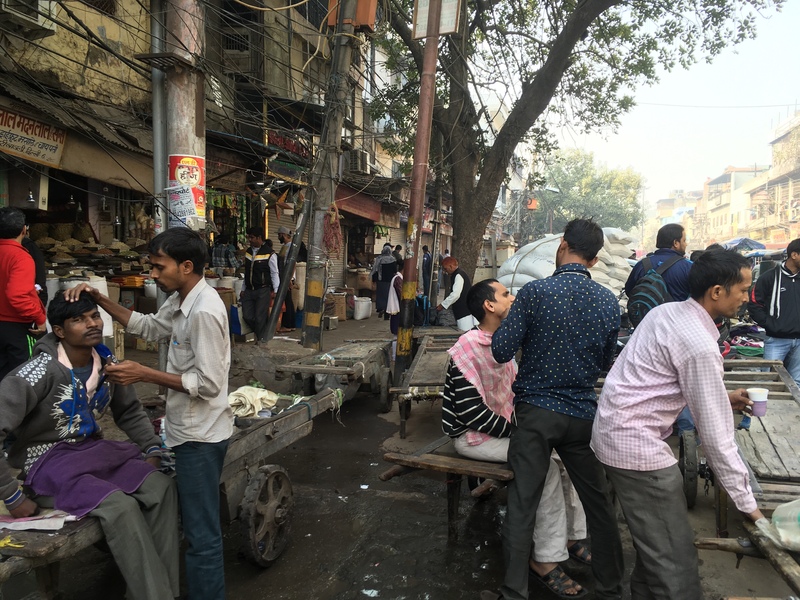 In the market area we saw men having their breads trimmed and even getting their ears cleaned with tweezers!!! 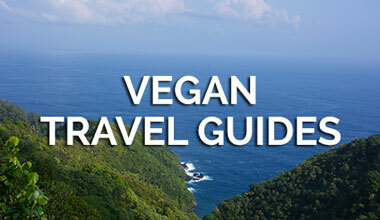 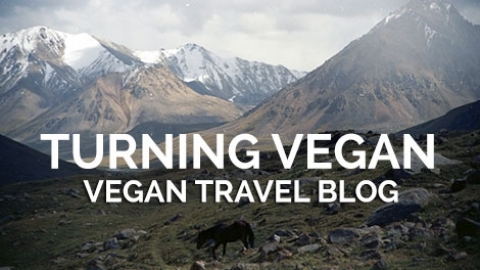 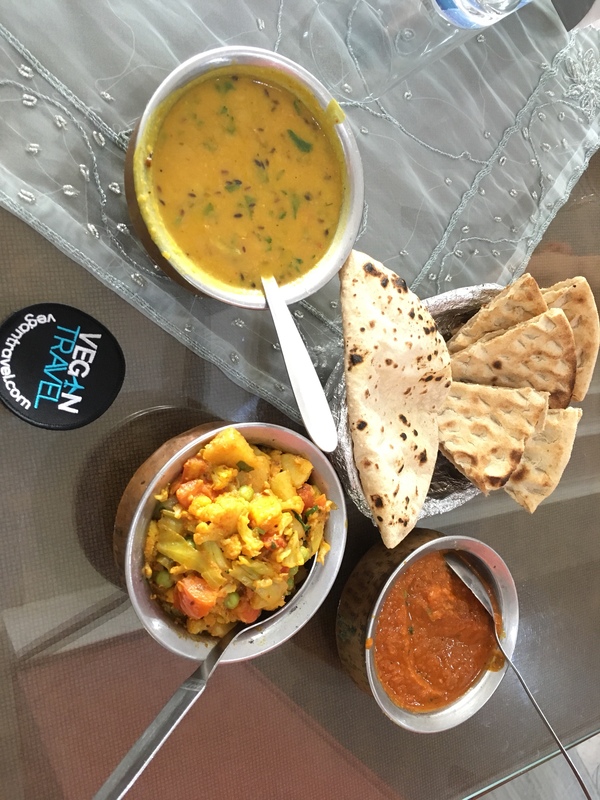 To eat vegan in India should be easy because the country is generally vegetarian, but they cook a lot in ghee (clarified butter). 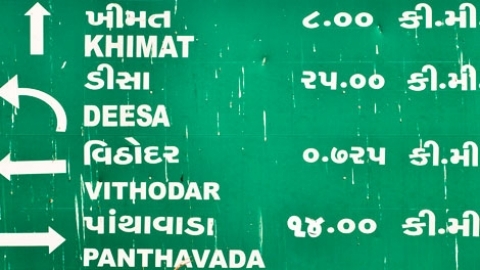 Although there is a change to cooking in oil because ghee is more expensive. 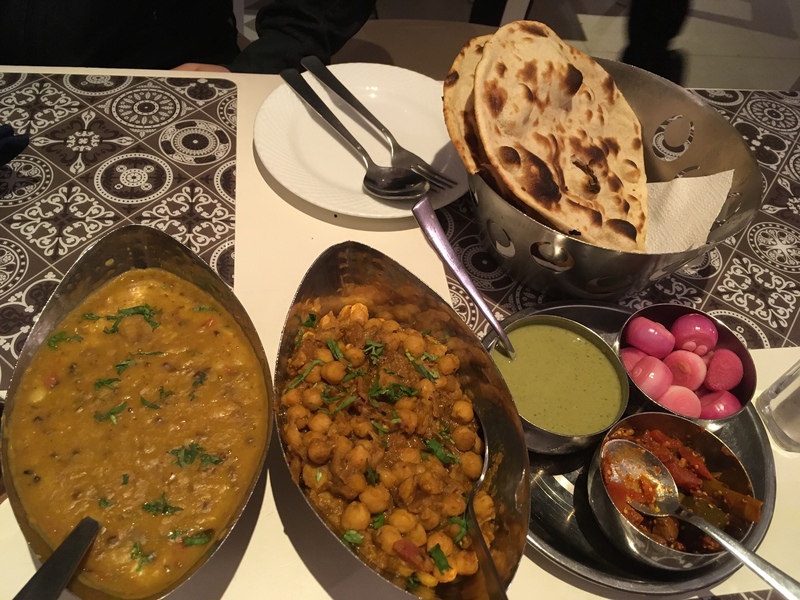 We basically ate the same food for lunch and dinner, and sometimes breakfast! 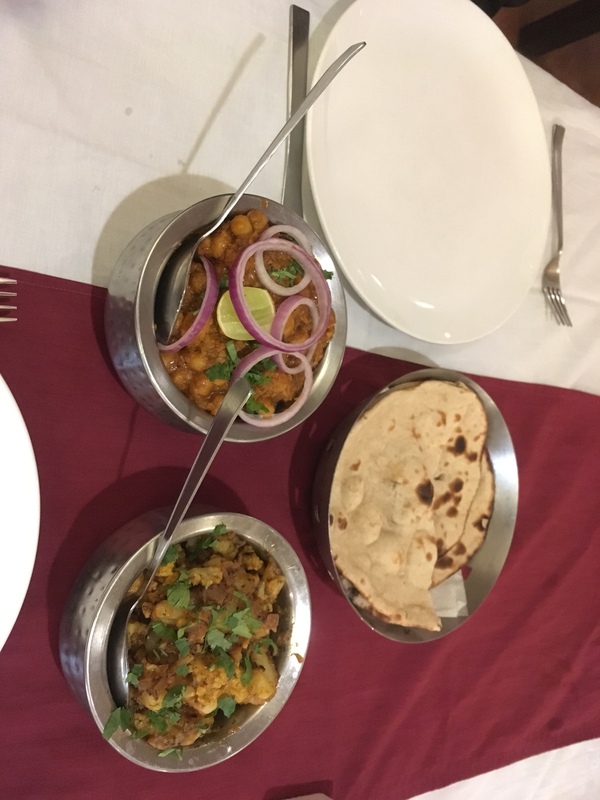 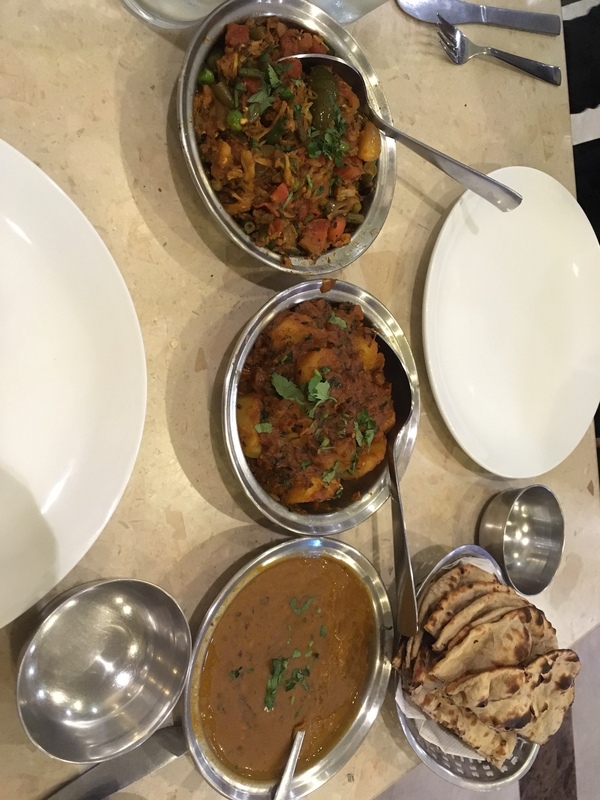 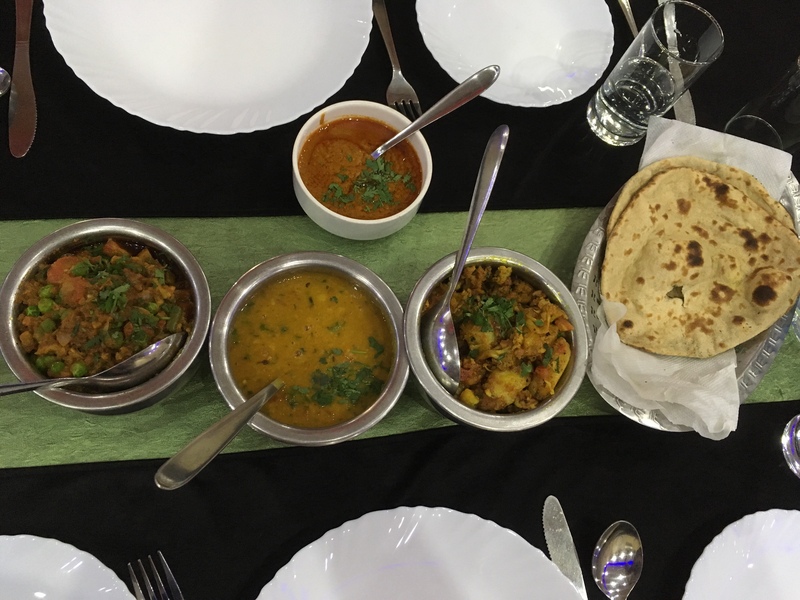 We ate chickpea curry (chana), vegetable curry, spinach curry (saag), potato curry (aloo gobi), lentil curry (dal) and roti/chapati. 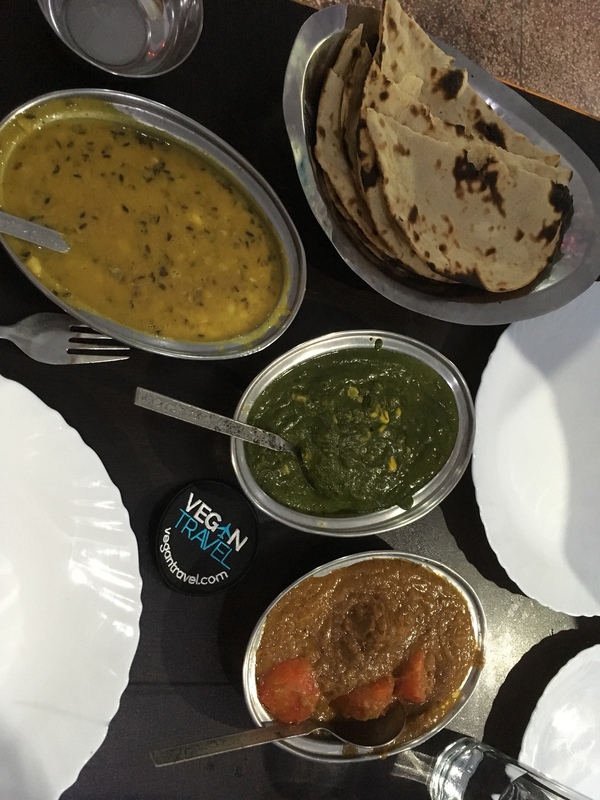 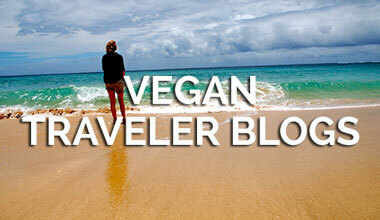 Be careful that naan bread normally contains butter and/or yoghurt, and paneer means cheese. 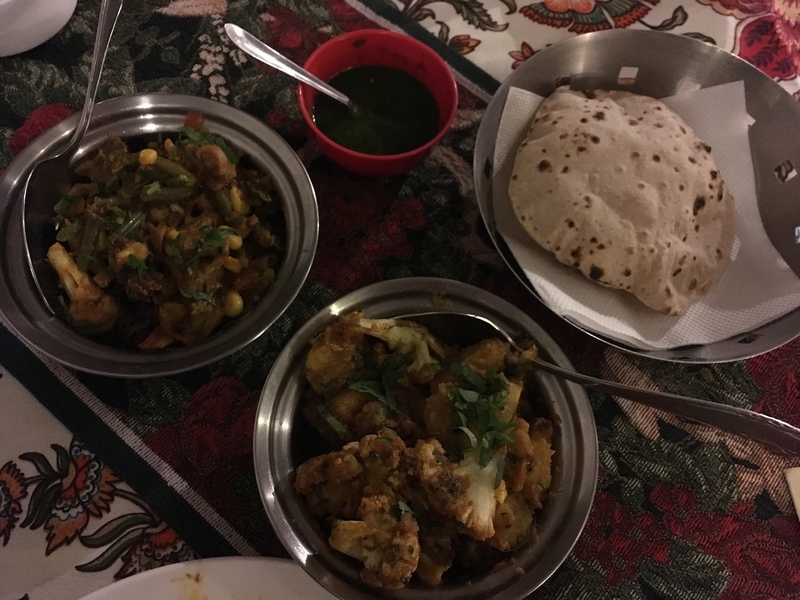 In all the food photos it will be a combination of these curries and bread. 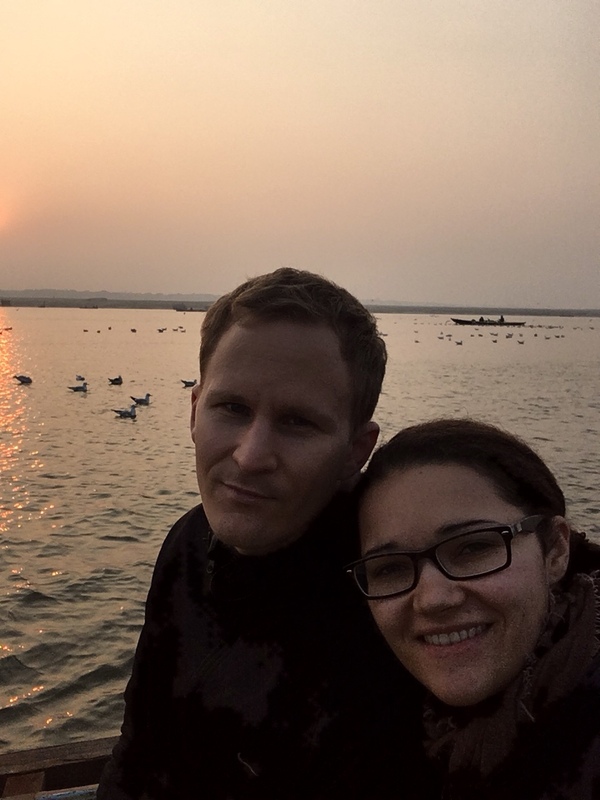 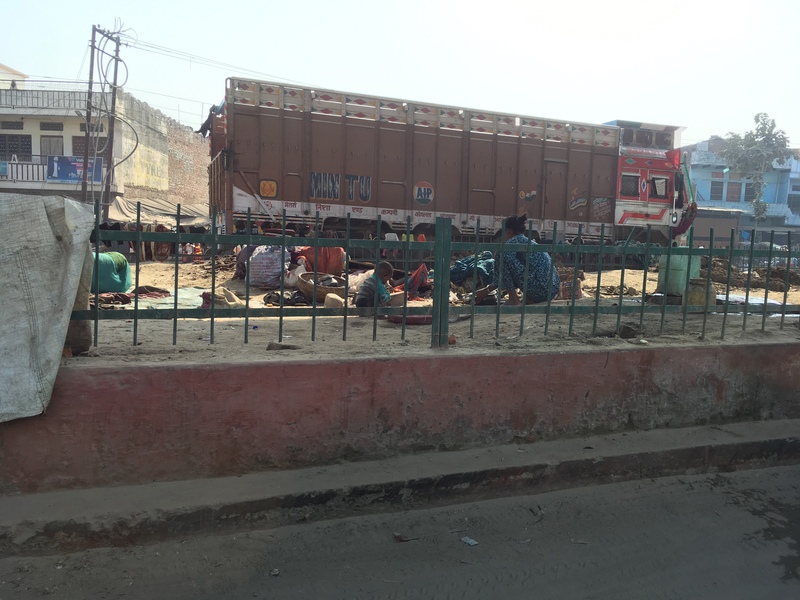 We took the train very early in the morning to Agra, it took less than two hours from Delhi or Agra. 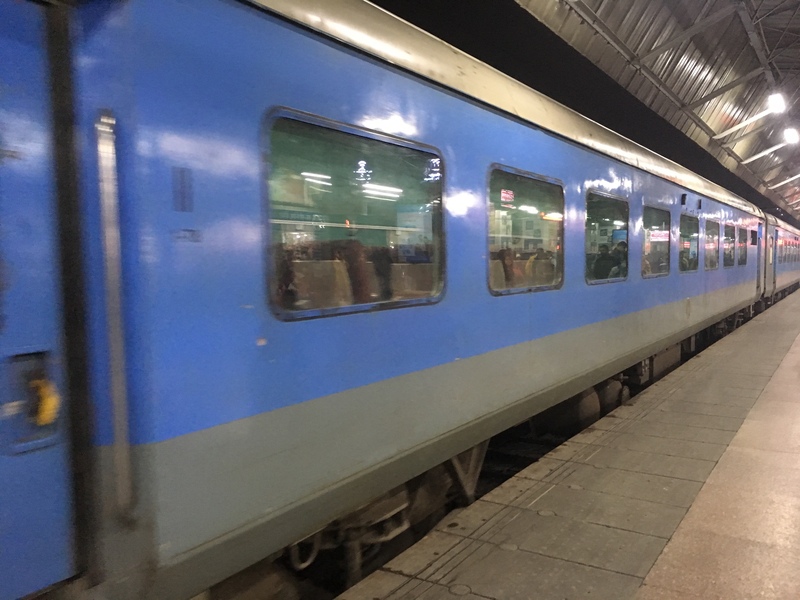 The train culture is big in India, so it was a definite must for me go on at least one train. 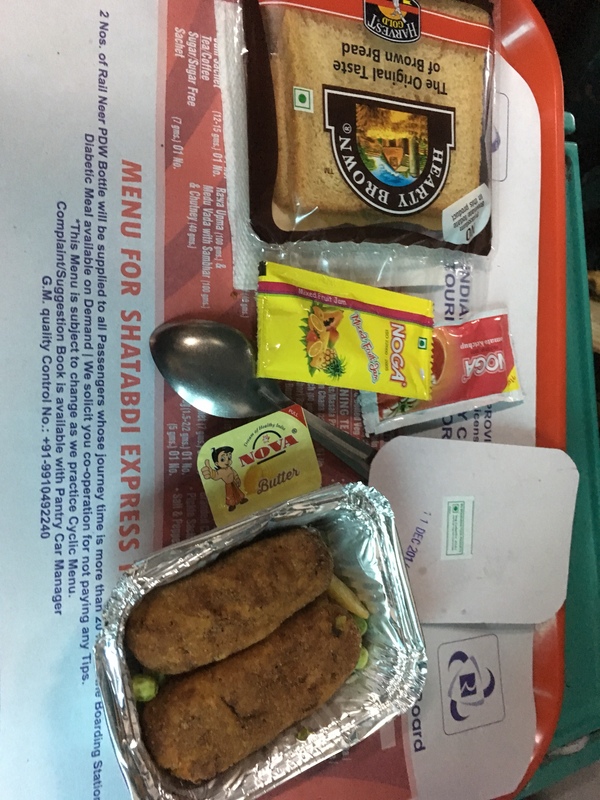 We did get a vegan breakfast on the train, it contained bean/sweetcorn deep fried fingers, four (!) 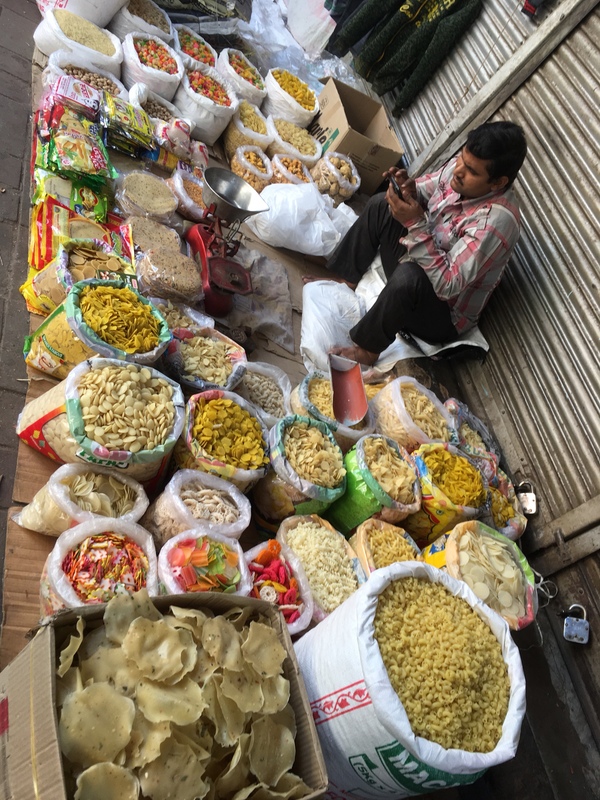 chips, peas, bread, jam and butter (! 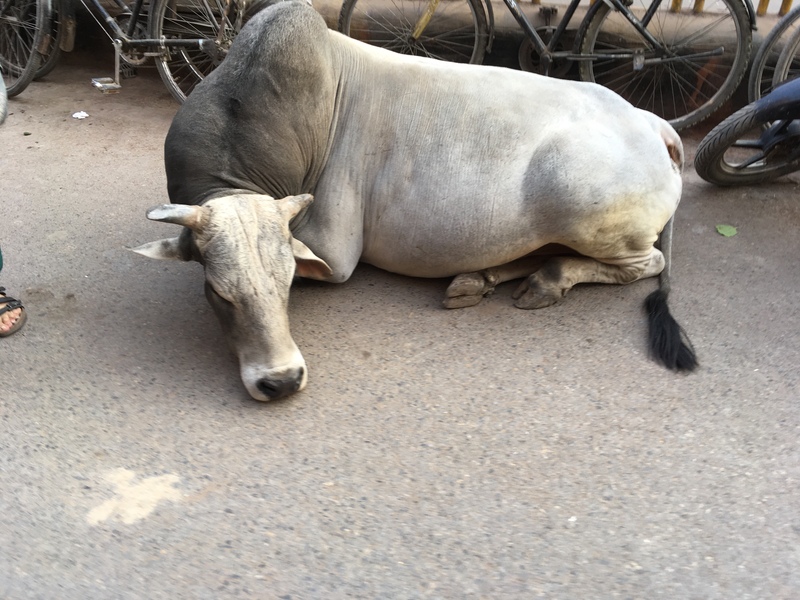 ), tea. 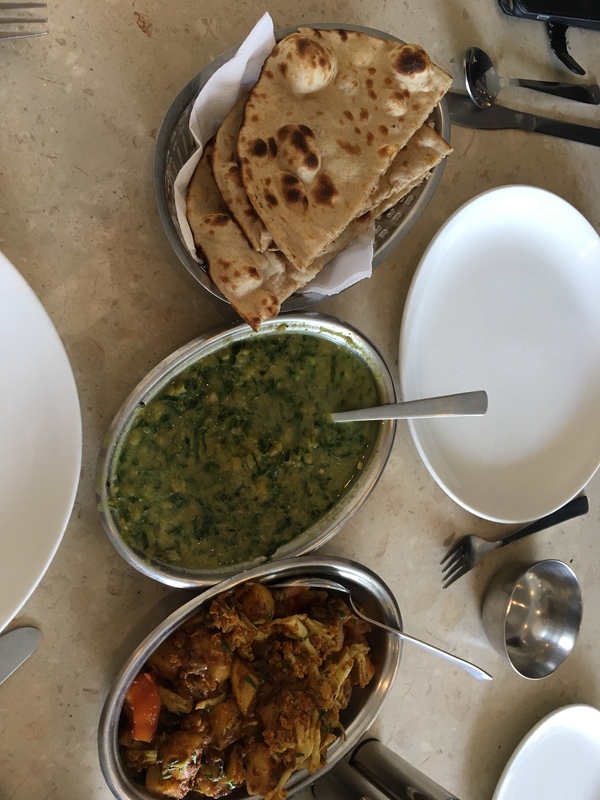 The food was not amazing. 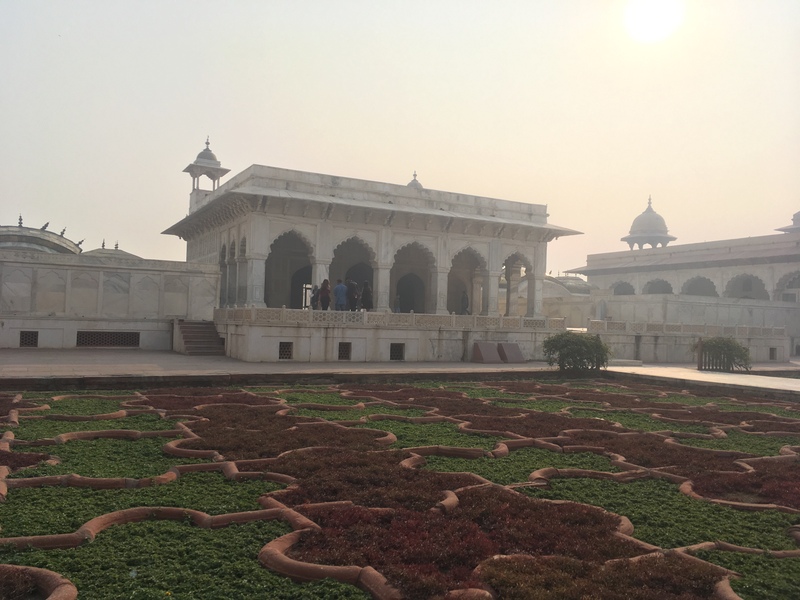 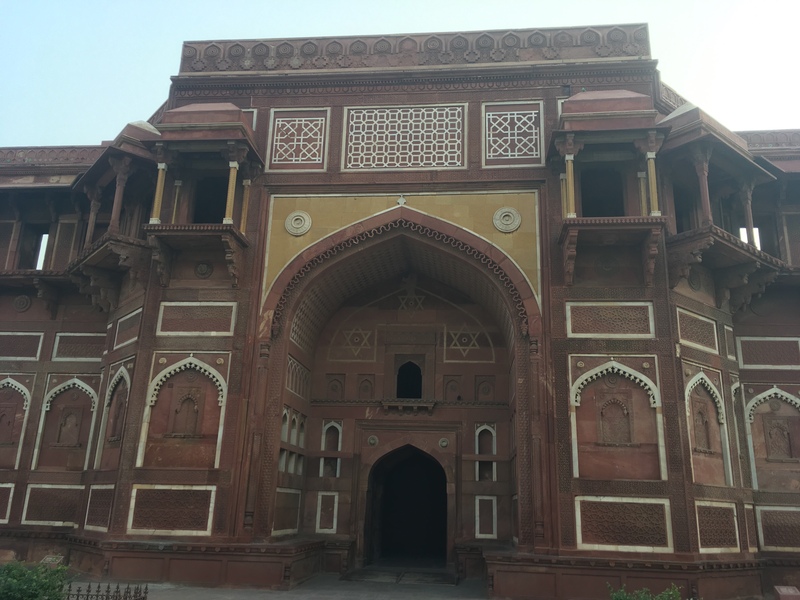 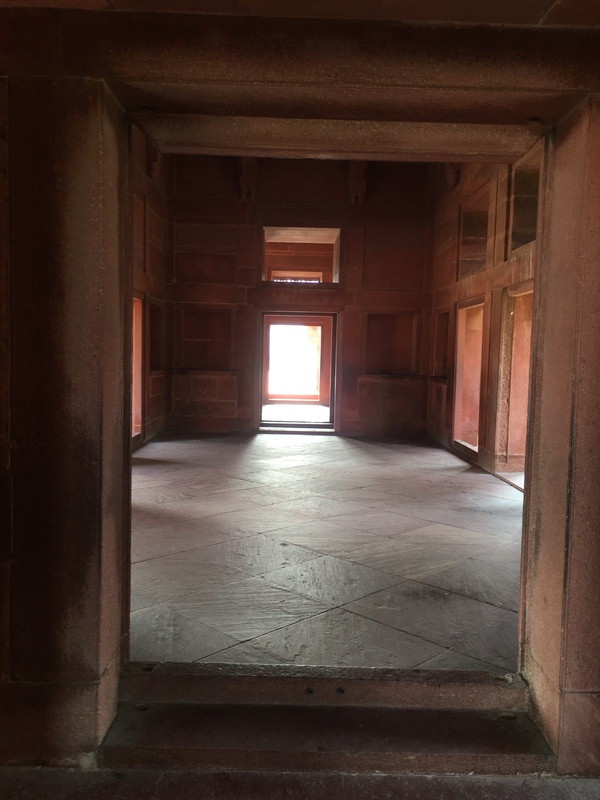 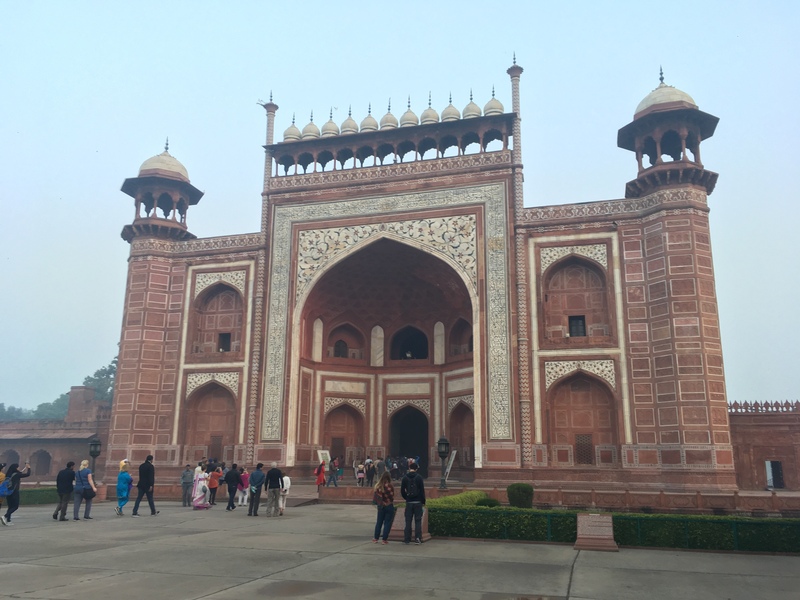 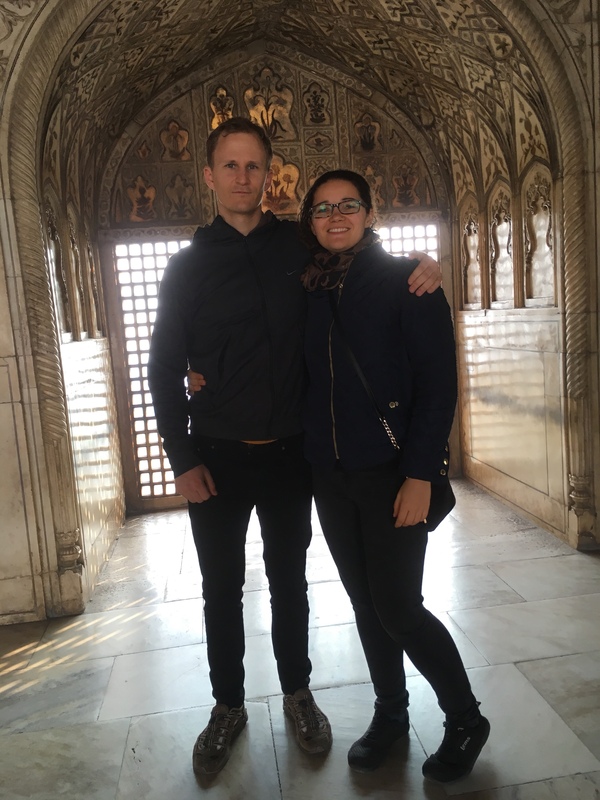 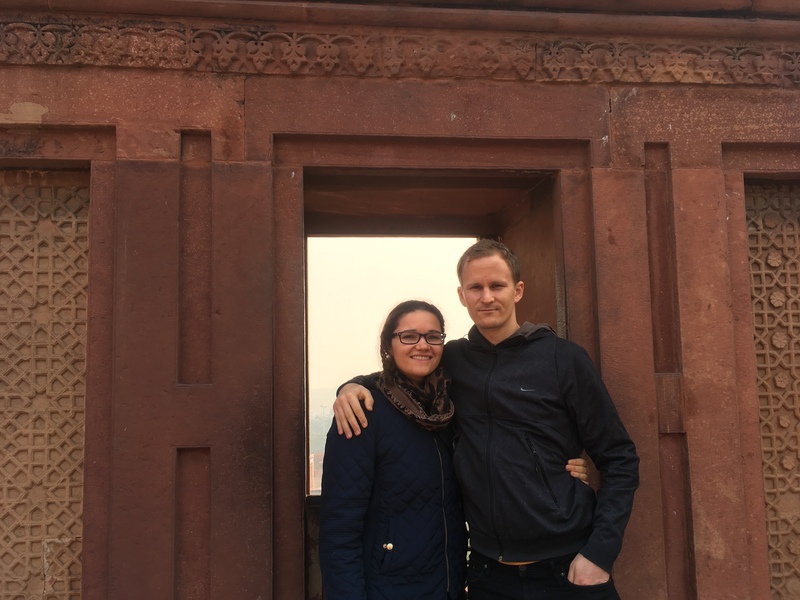 We went to the Agra Fort, and was pleasantly surprised at how nice it was. 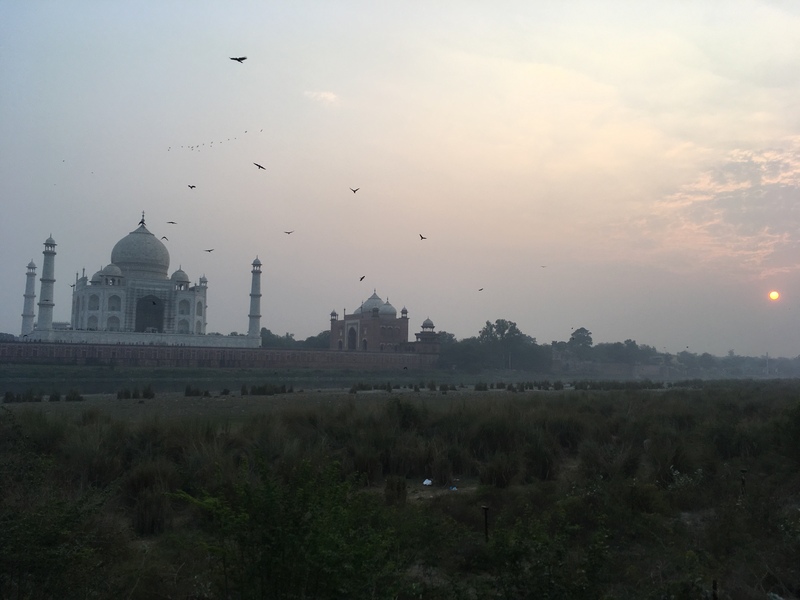 Then we had sunset at Taj Mahal, which was beautiful. 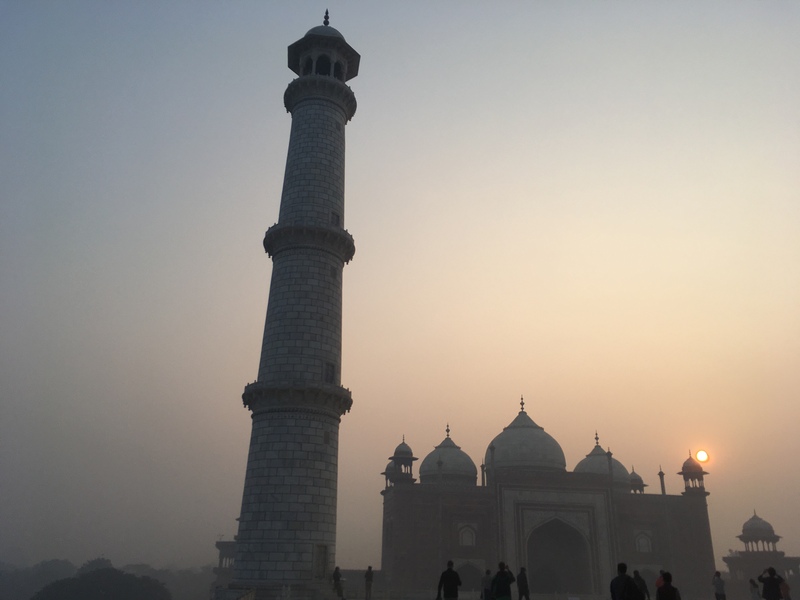 The next day we also had the sunrise at Taj Mahal and that was worth it. 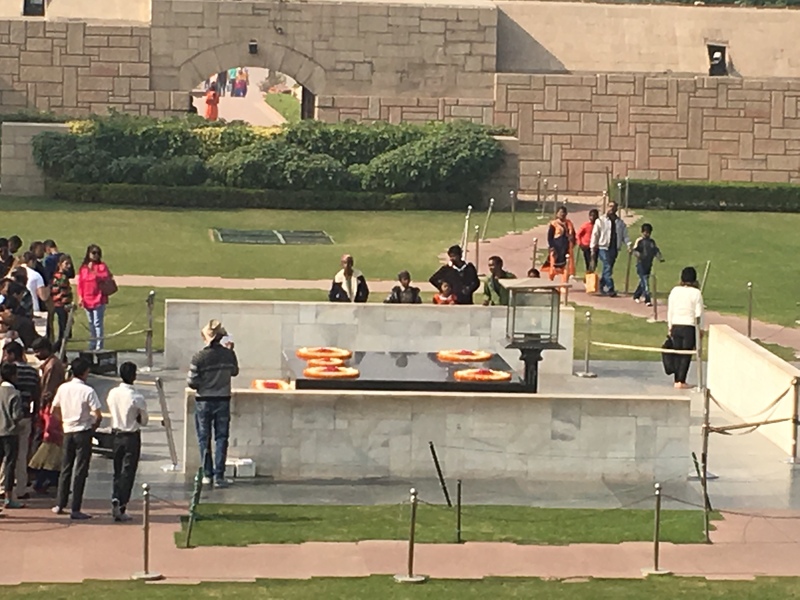 Be careful about people selling fraud tickets outside, we had some English man come up to us saying that the queue was too long and he was selling the tickets for 50% off-not true! 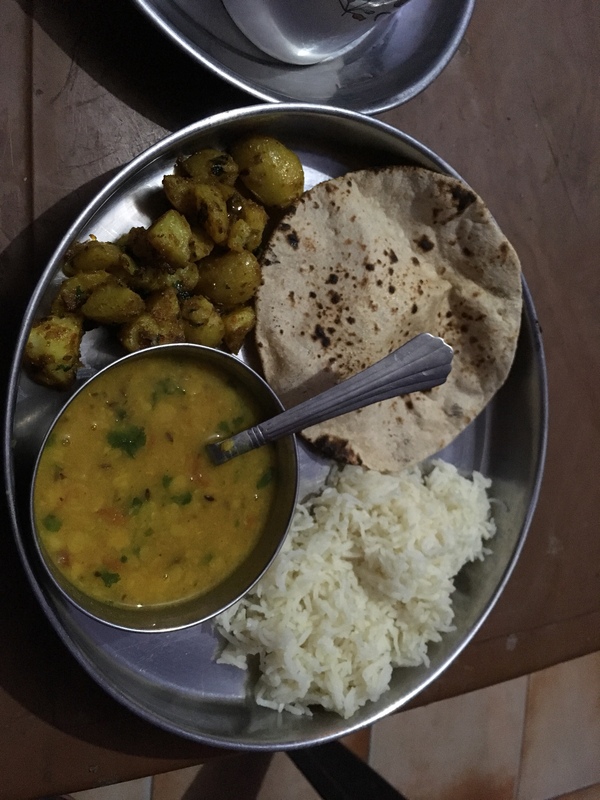 We also had food at our guides house, his wife made us potato curry, lentil curry and roti. 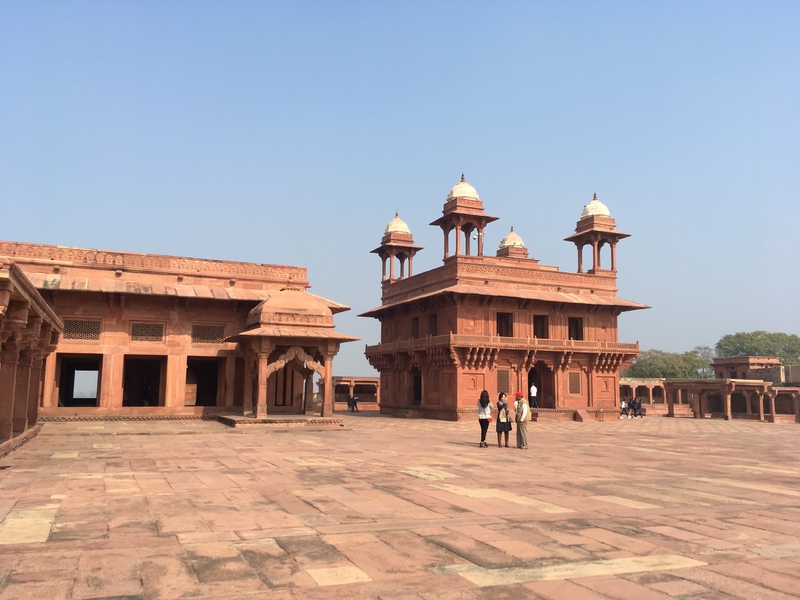 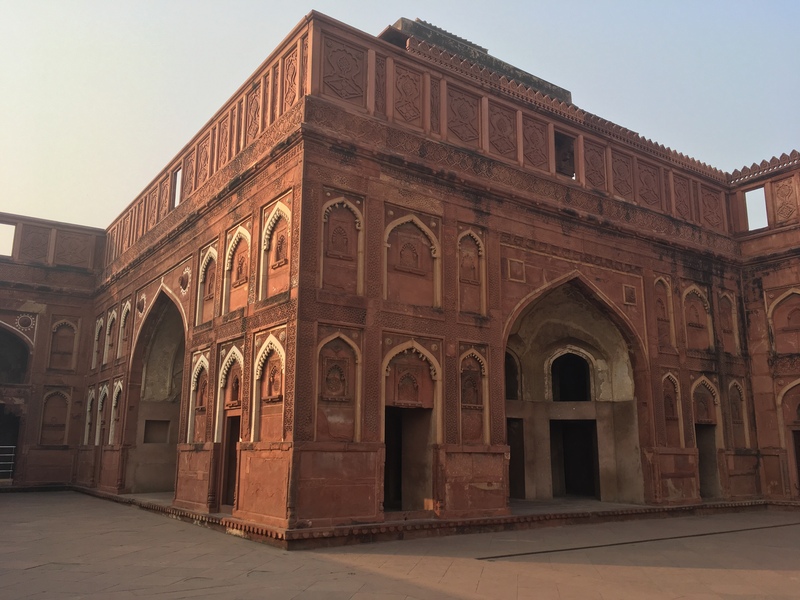 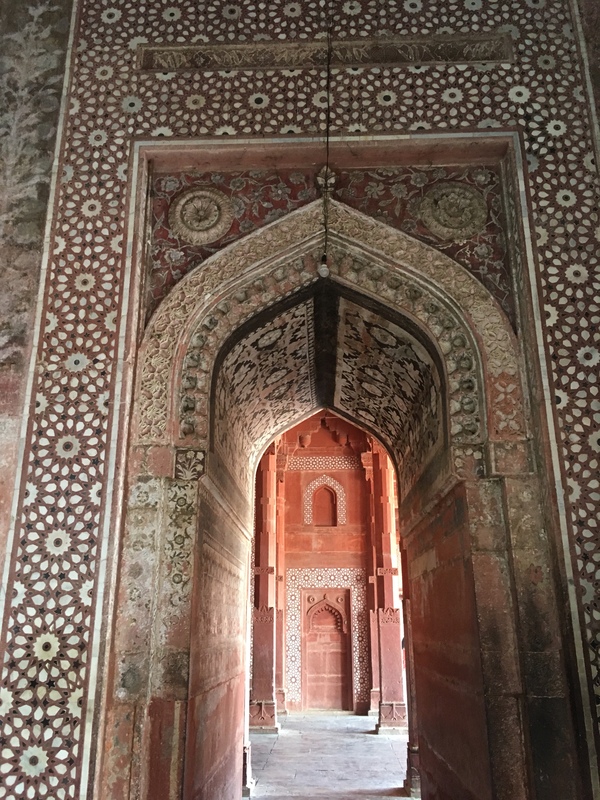 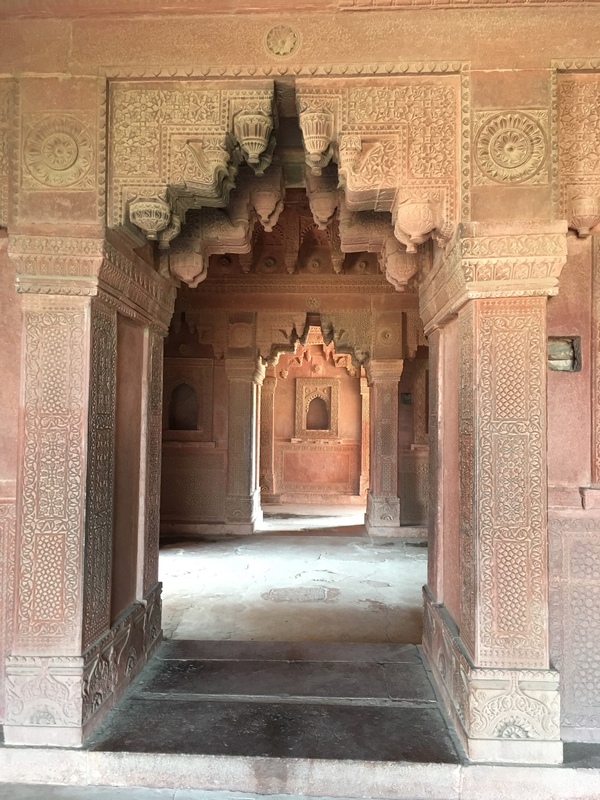 Fatehpur Sikri is an abandoned city near Agra and was worth going to, along with the Jama Masjid mosque. 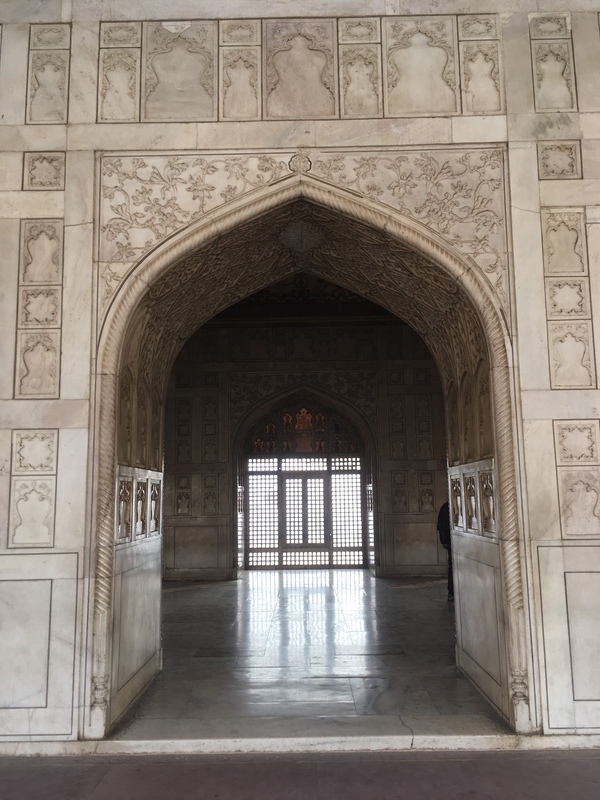 Although in the mosque some man tried to hit my head with a stick because it will bring me good luck! 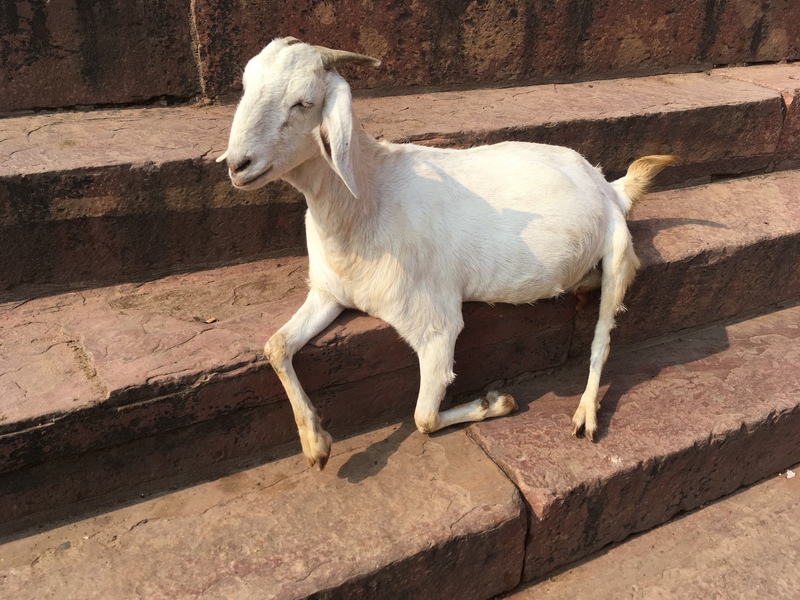 There are also cute goats outside! 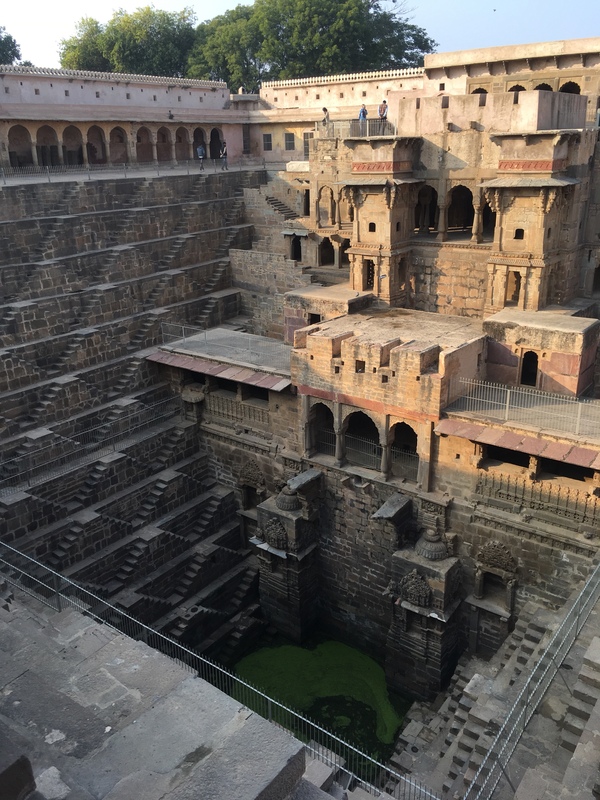 On the way to Jaipur we drove to Chand Baori, a stepwell. 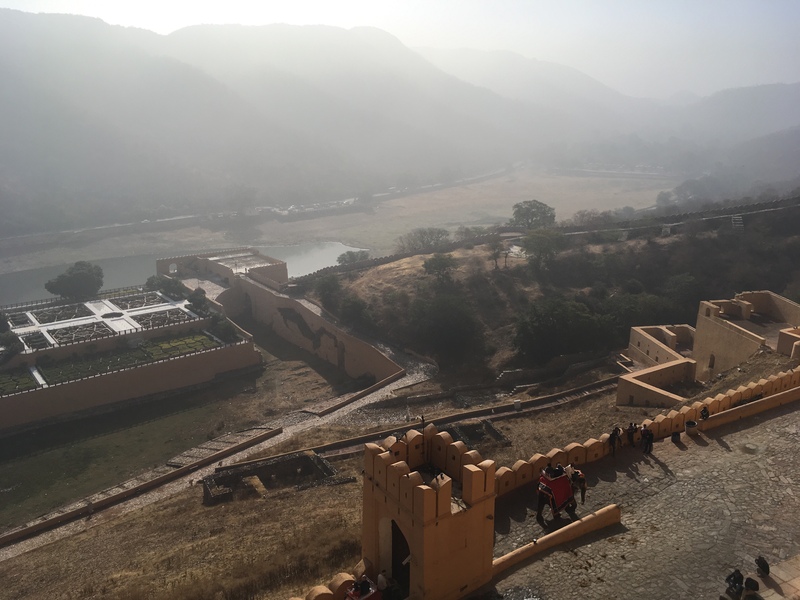 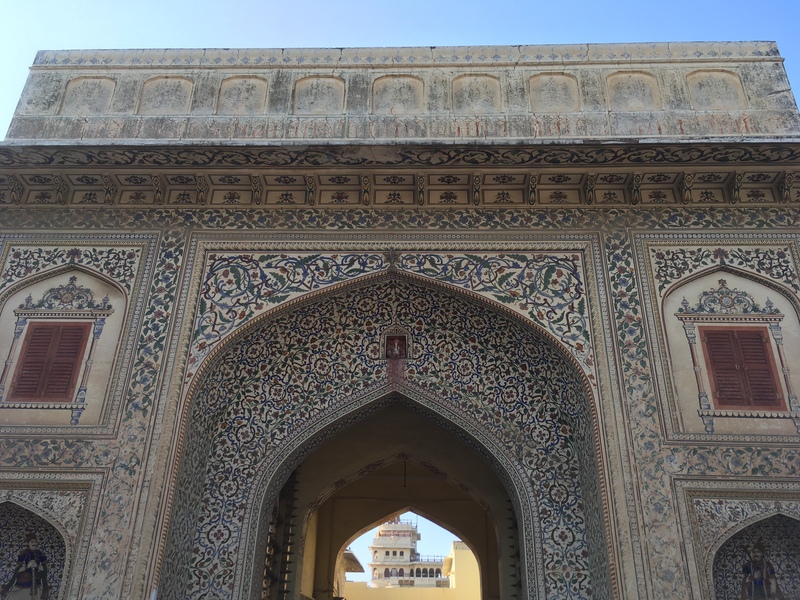 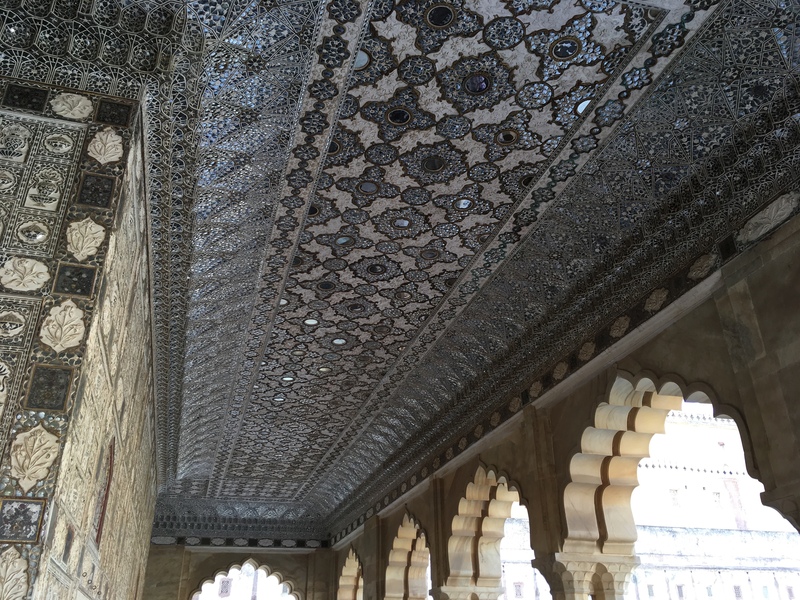 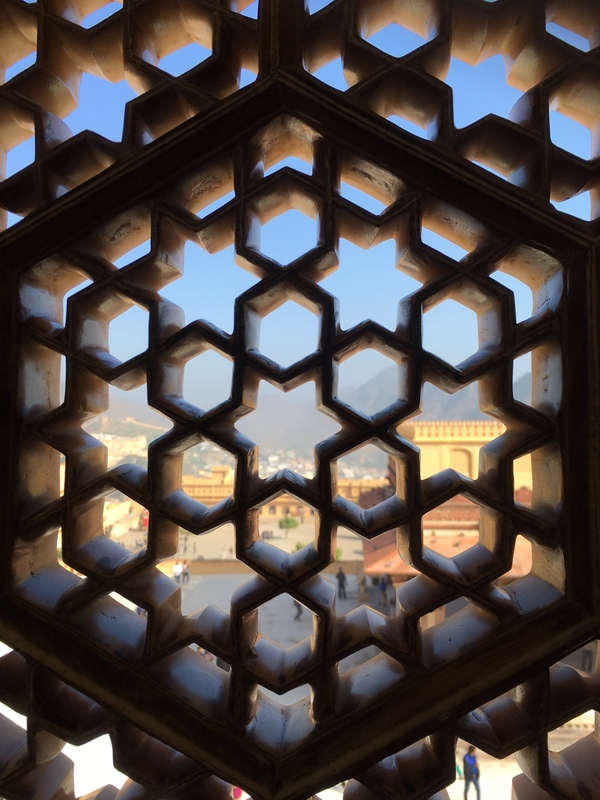 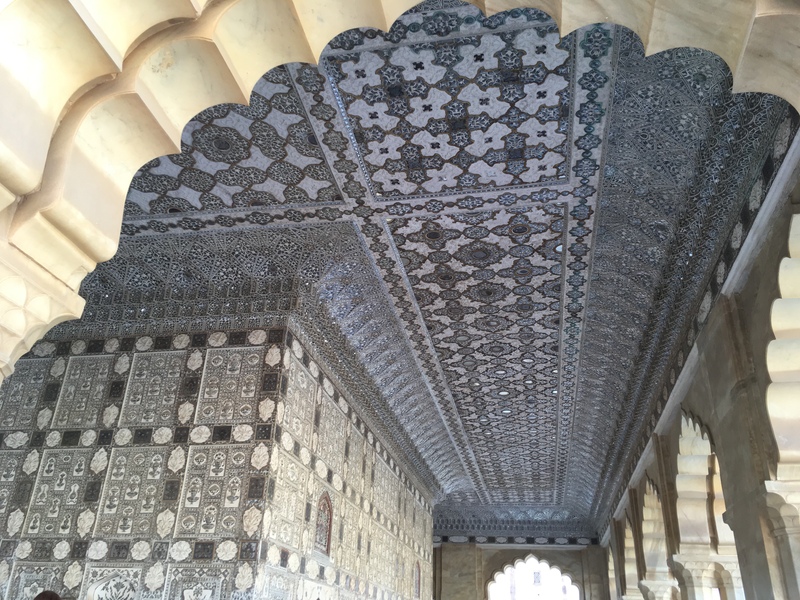 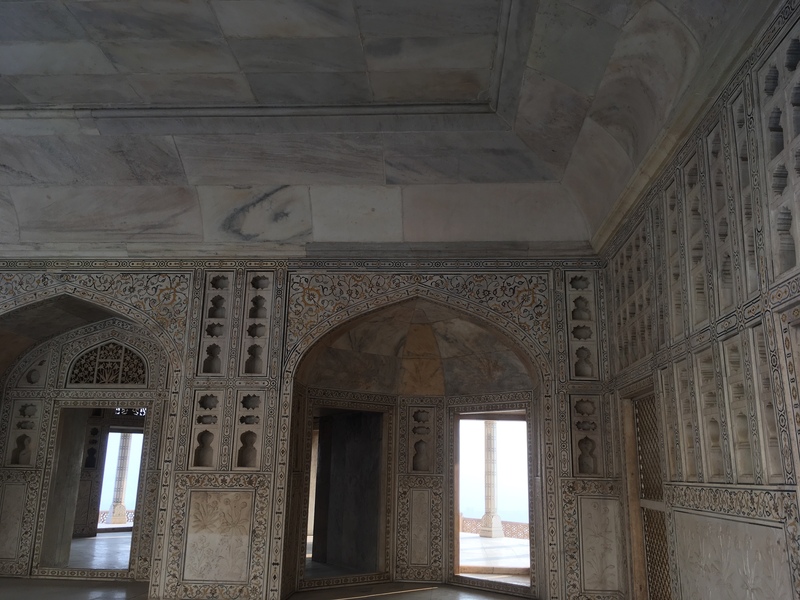 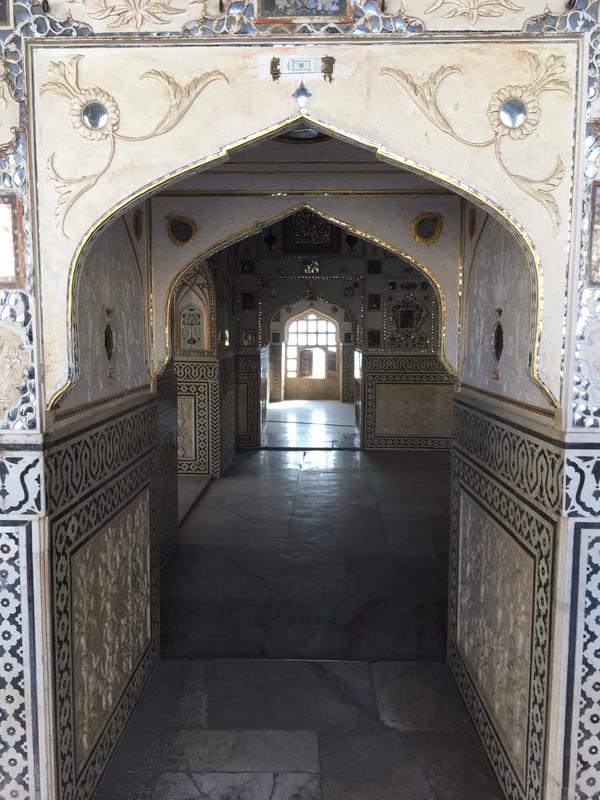 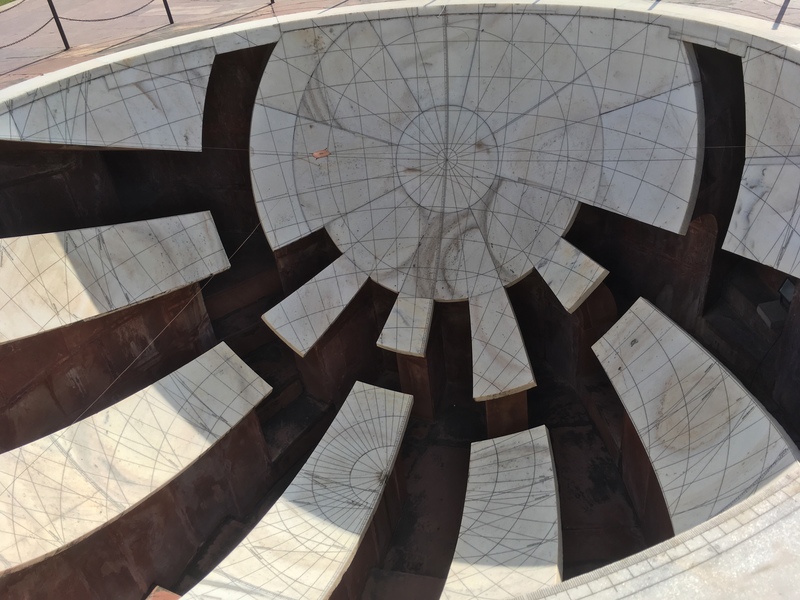 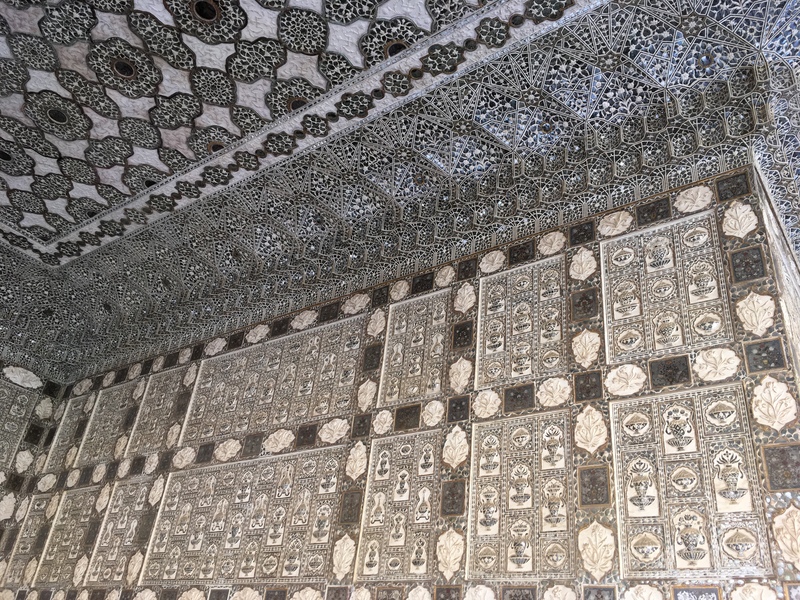 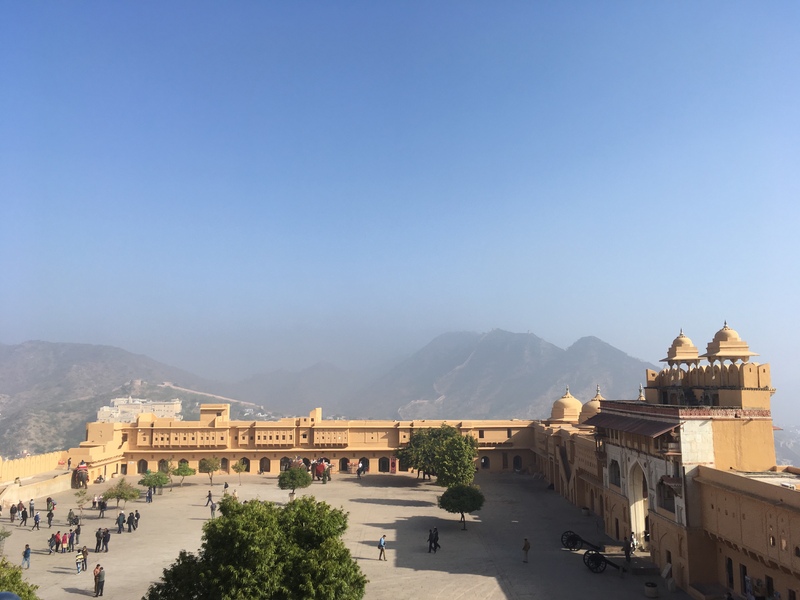 In Jaipur we saw the Amer Fort (we did not take the elephants to the fort) and inside there is a Mirror Palace and it is stunning. 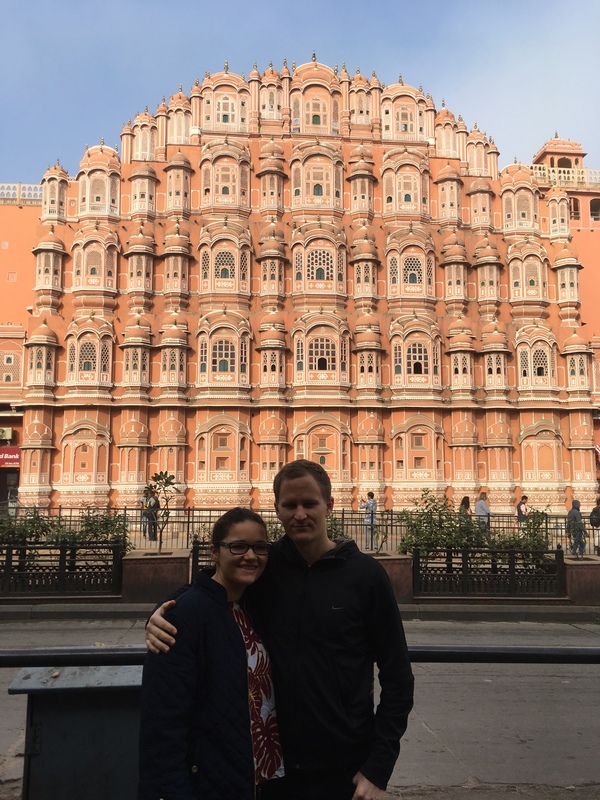 We also saw Hawa Mahal (we had to cross the street to take the photos which was incredibly scary)! 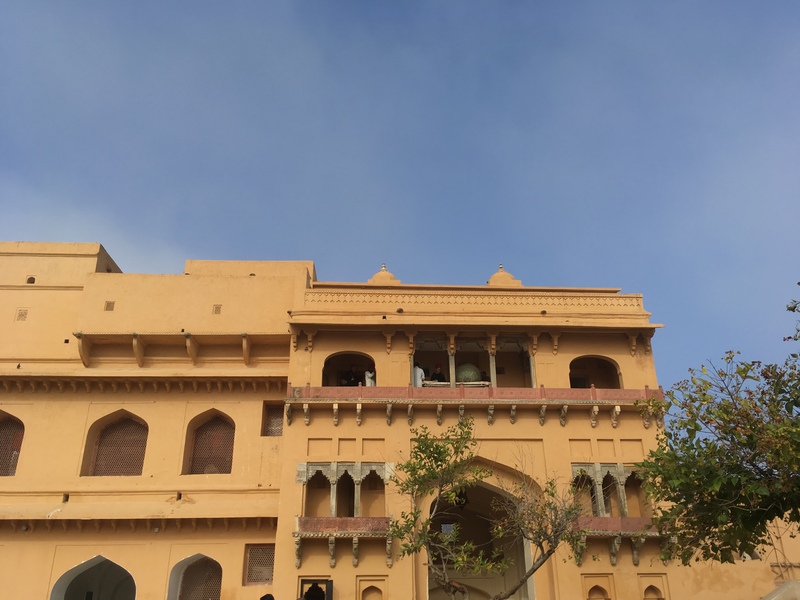 We saw the solar observatory and City Palace. 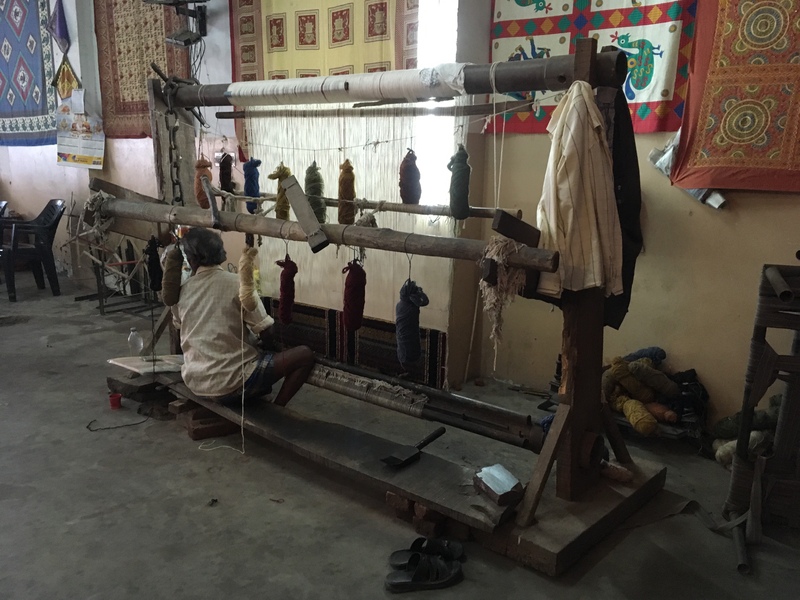 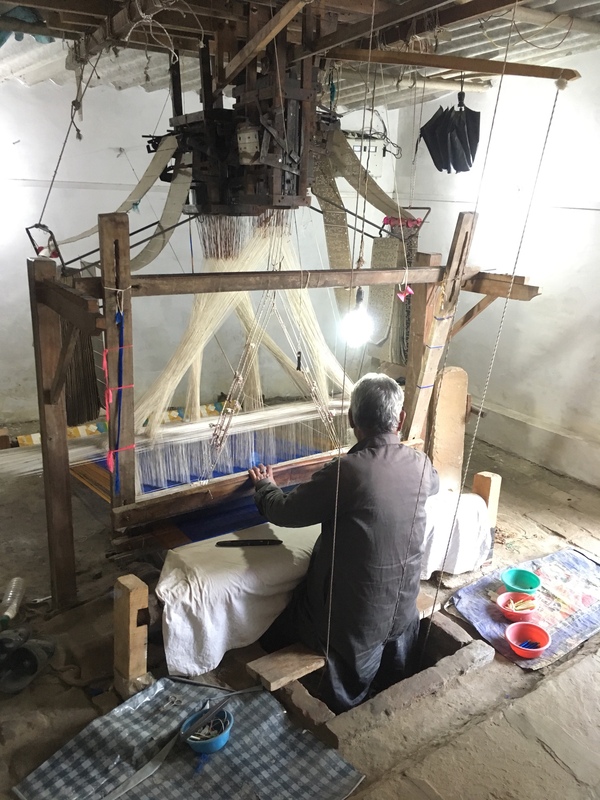 We also saw how carpets are hand made and block printing. 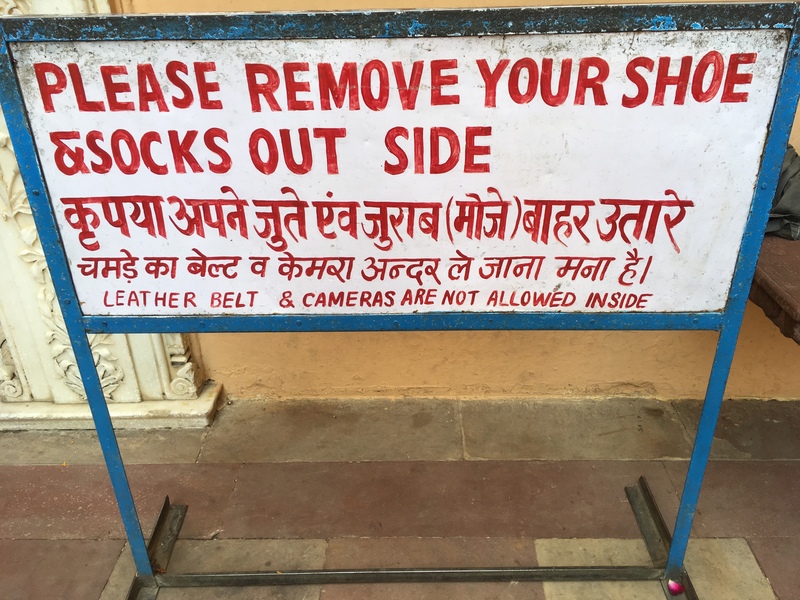 This place is crazy! 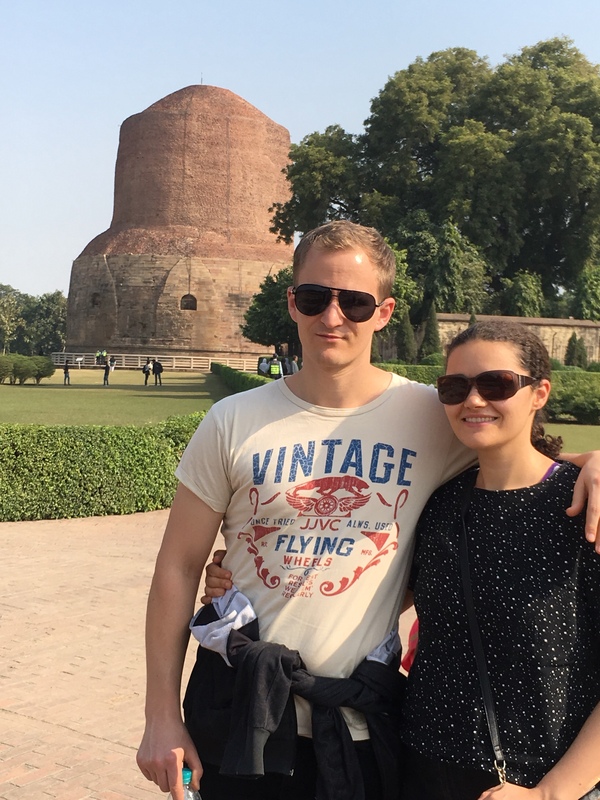 We started in Sarnath, where Buddha gave his first sermon. 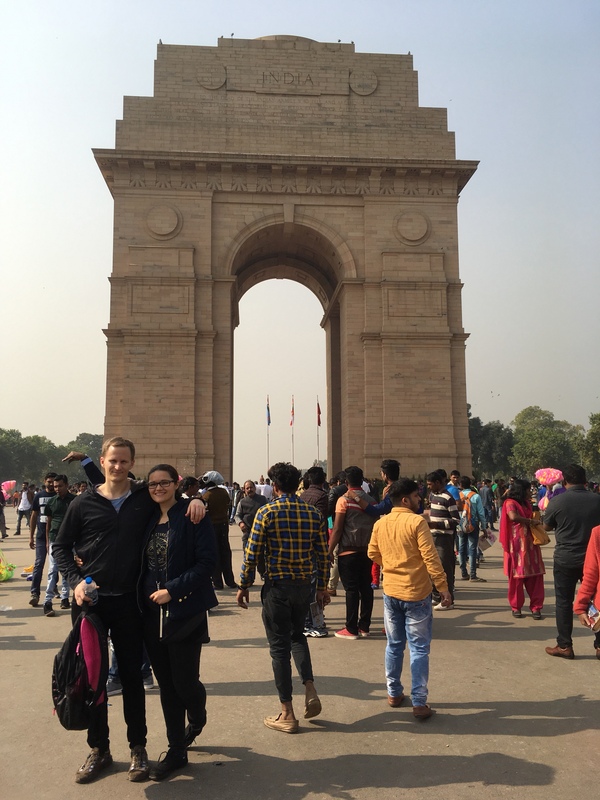 While here many school children wanted photos with us because we are westerns, this has happened many times during this trip where people stop us and ask for photos. 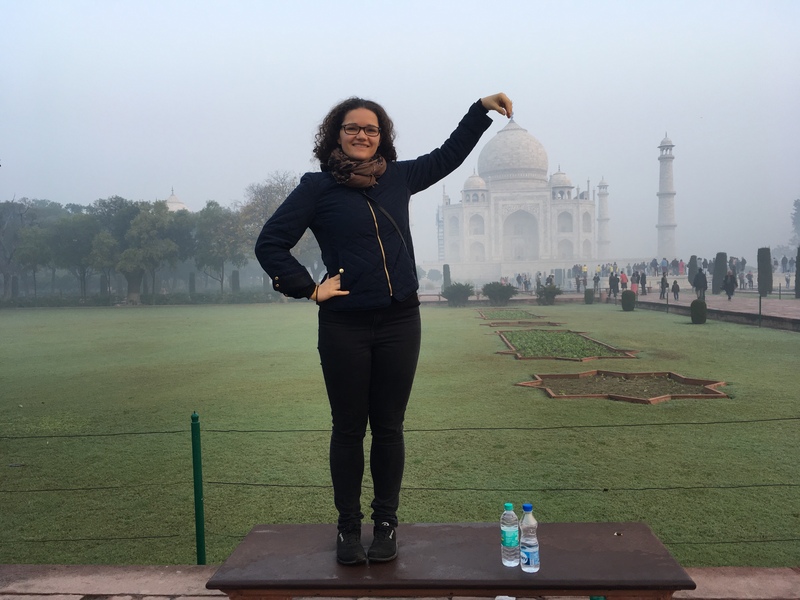 Not going to lie it felt great! 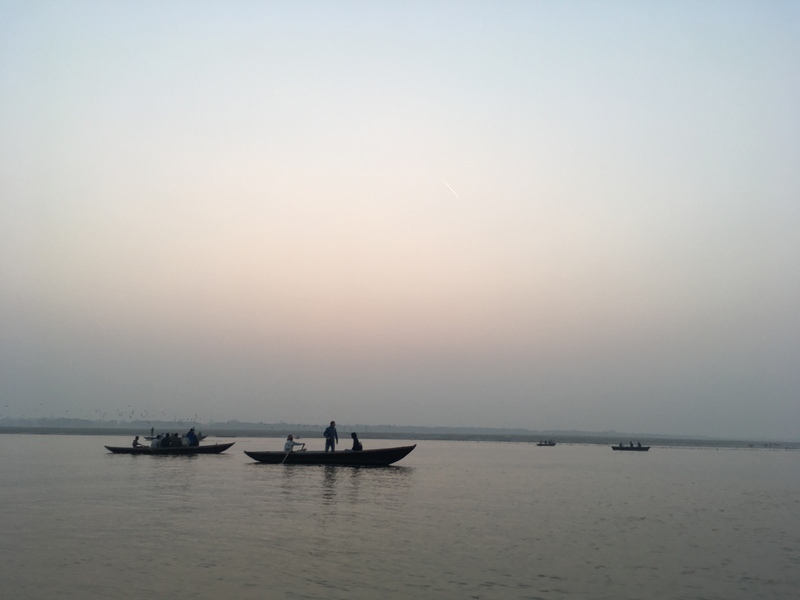 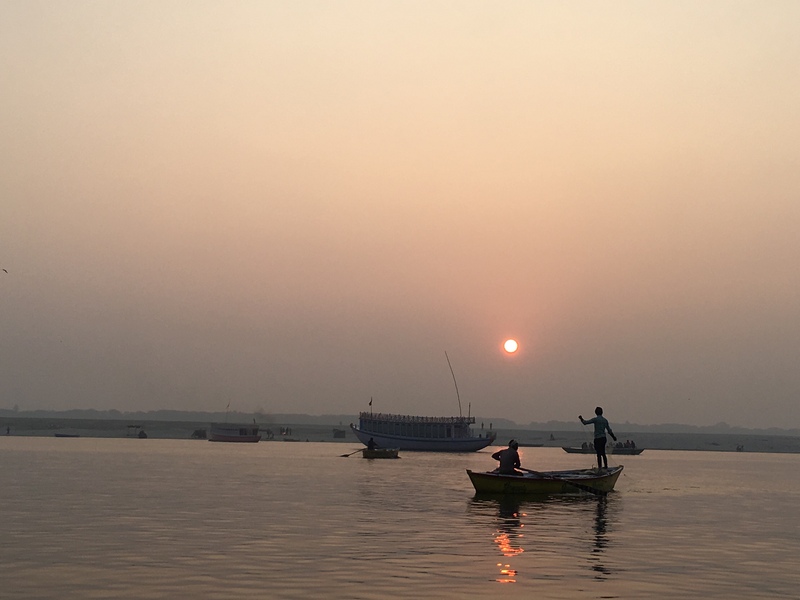 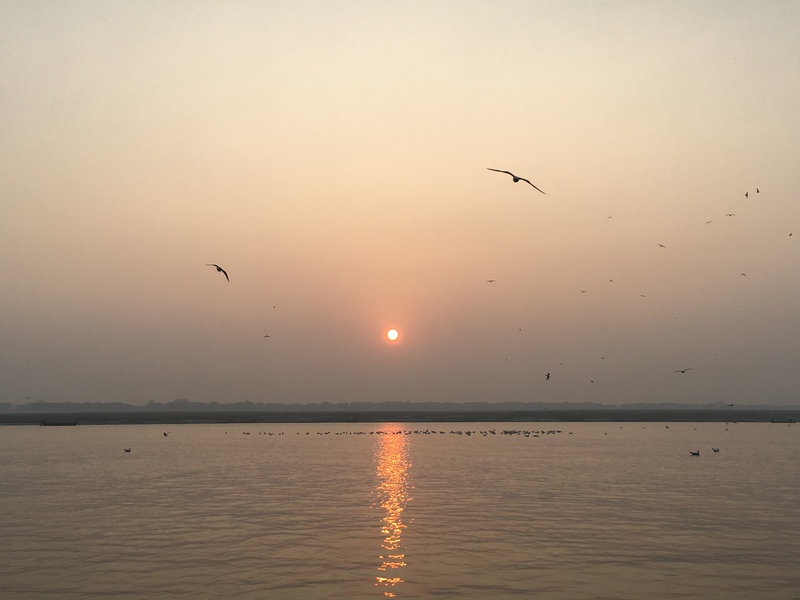 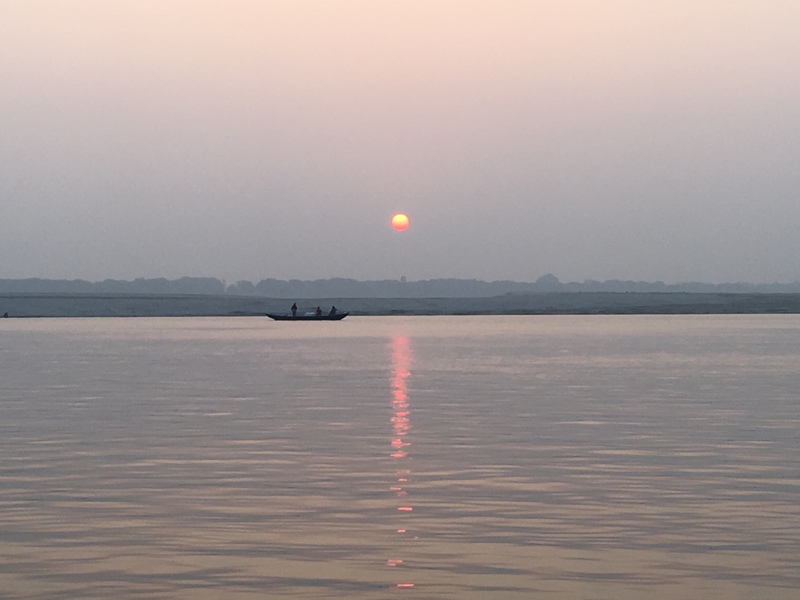 Then it was time for the Ganges, we did a sunset and sunrise boat tour. 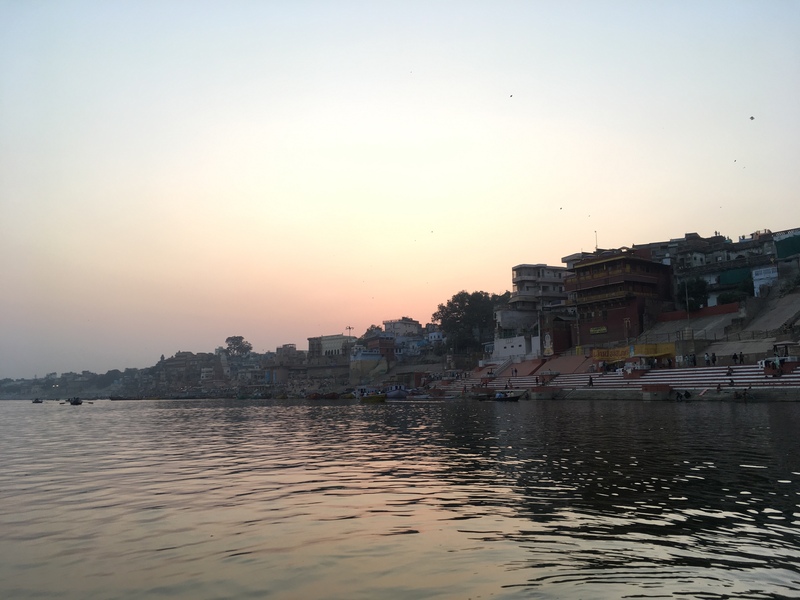 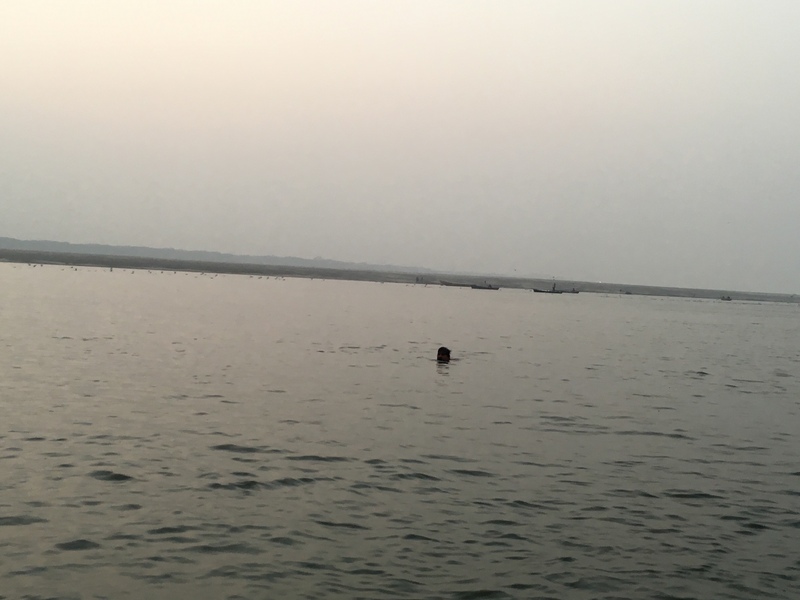 The views are amazing from the boat, we saw many people washing themselves and their clothes in the Ganges, and even someone swimming! 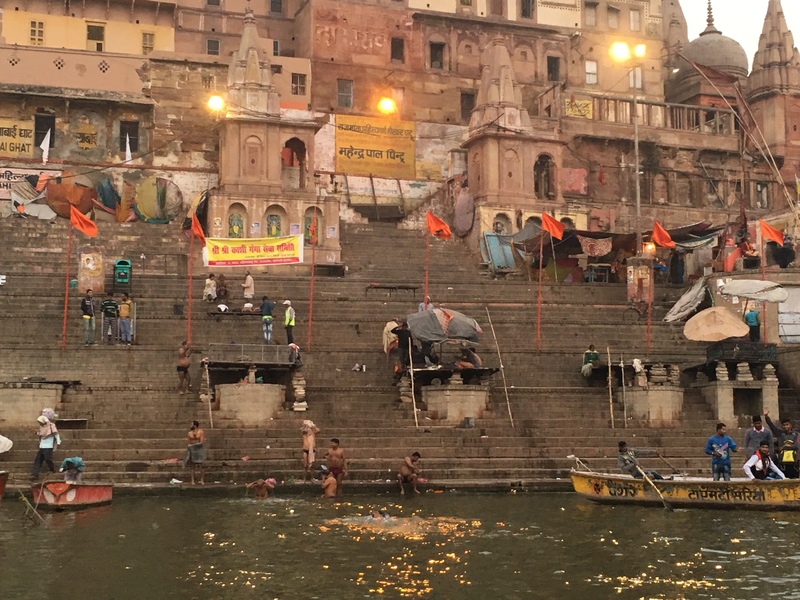 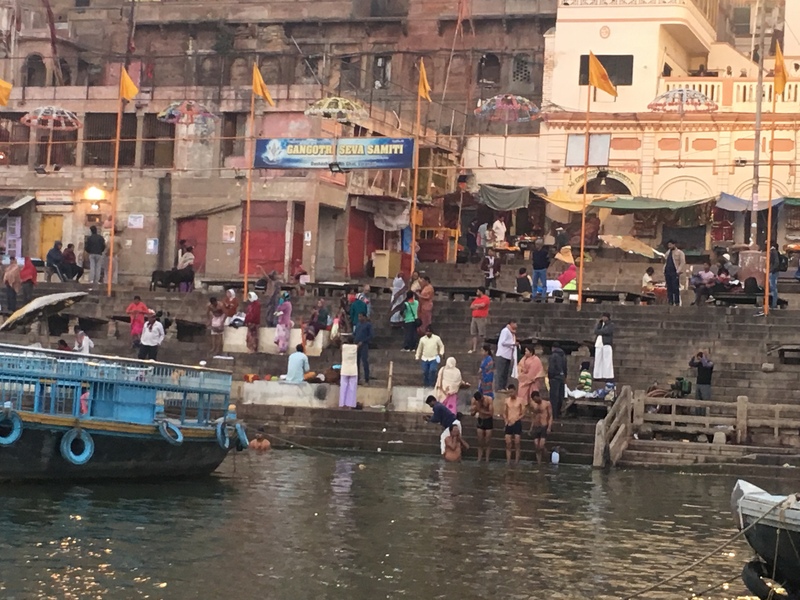 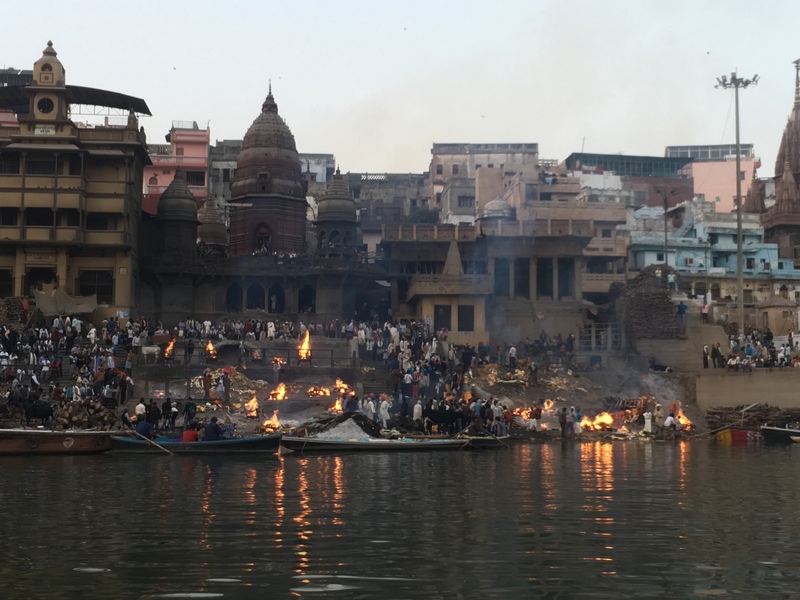 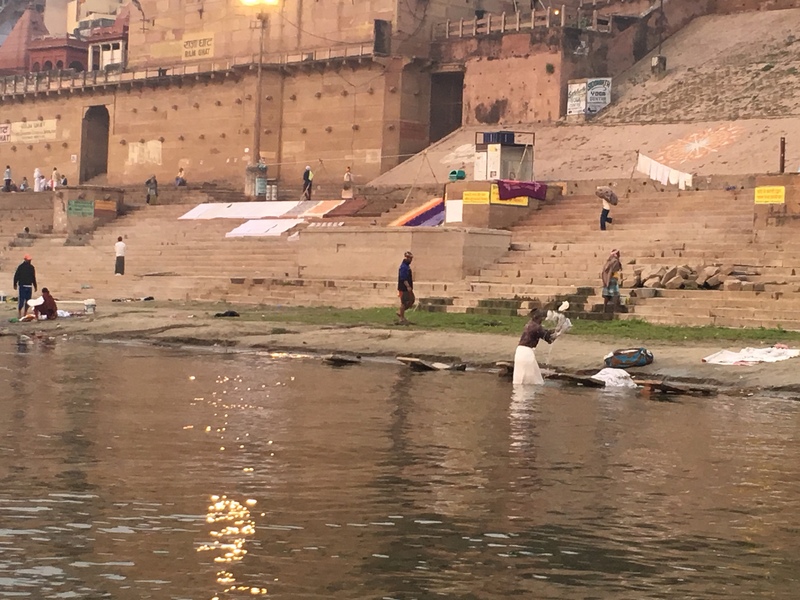 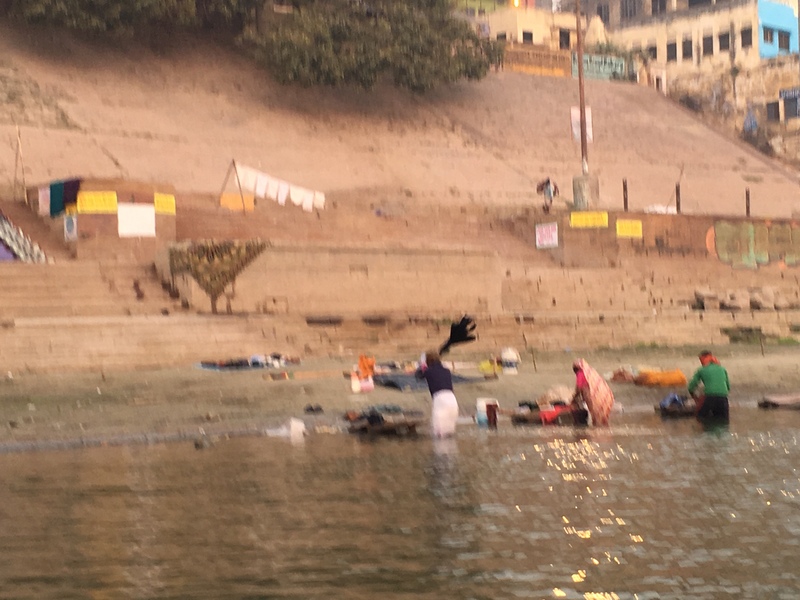 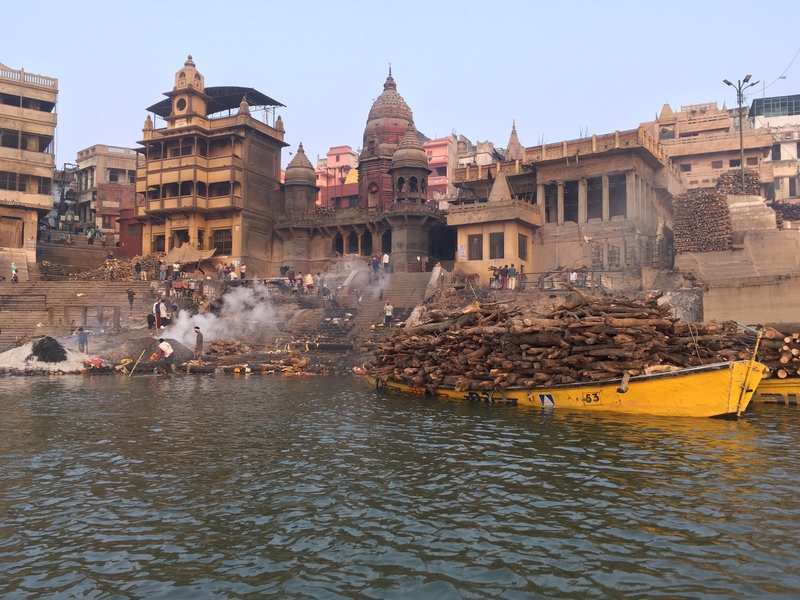 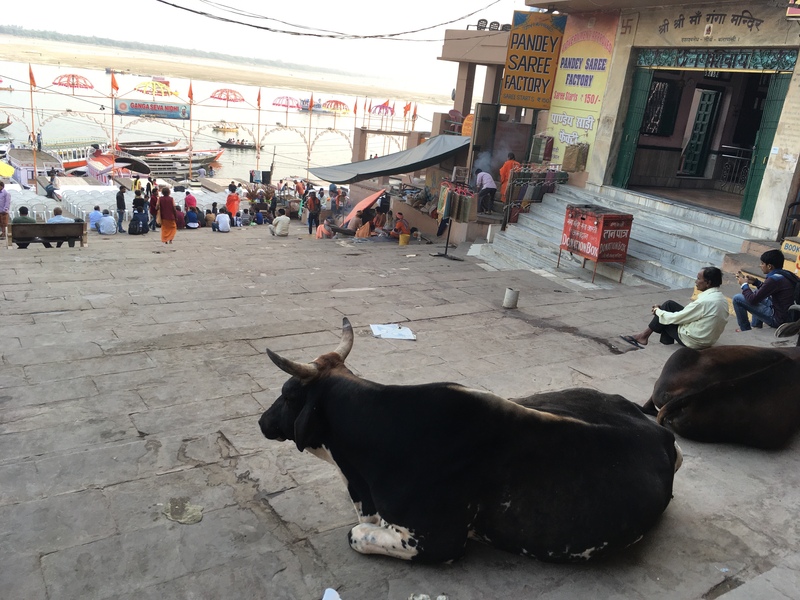 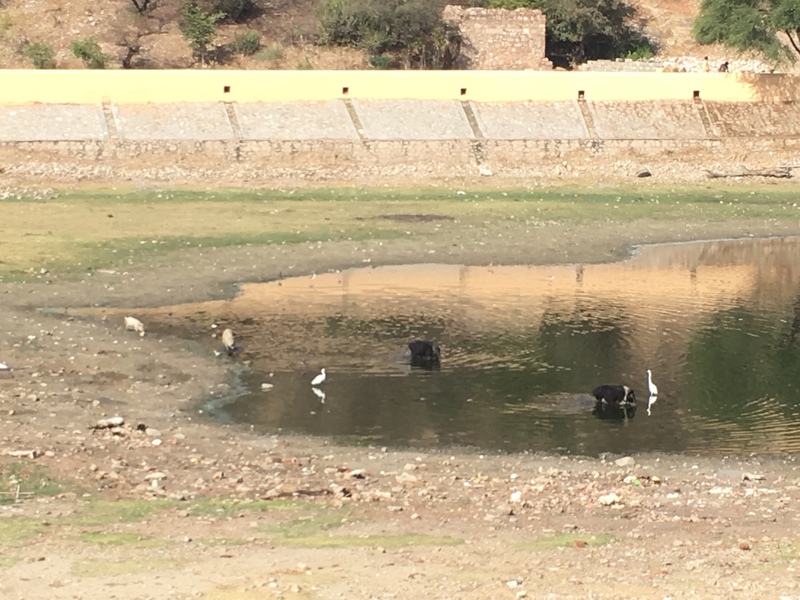 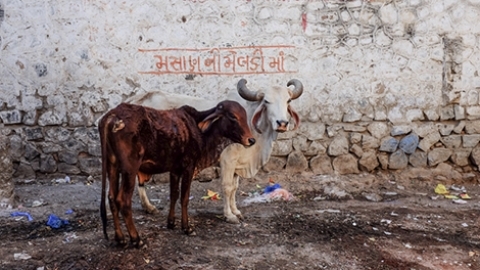 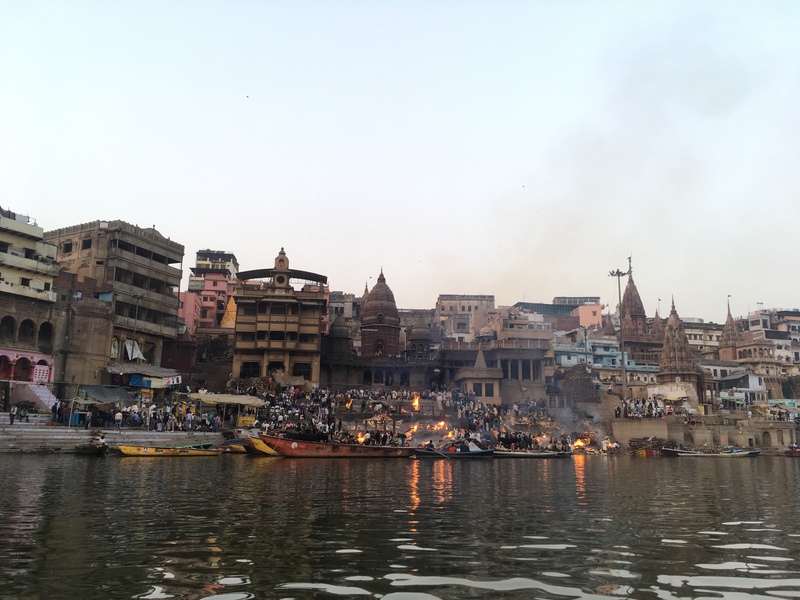 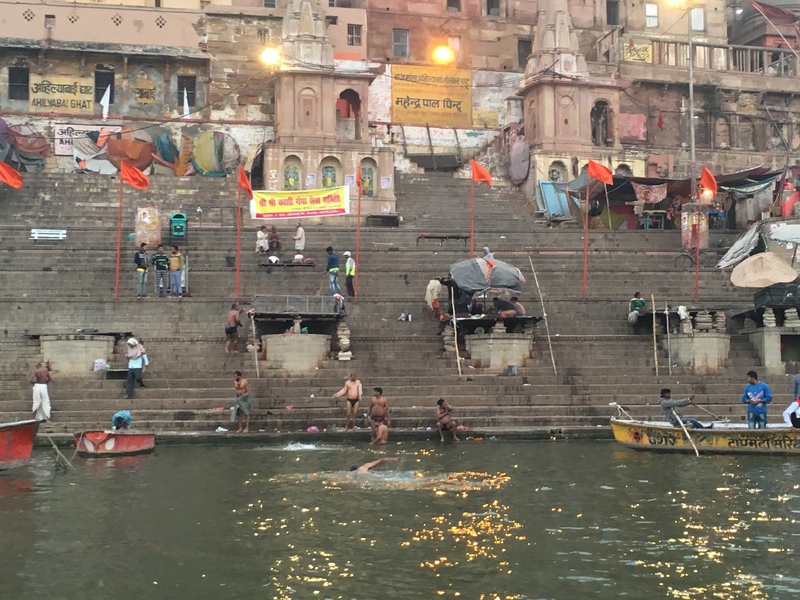 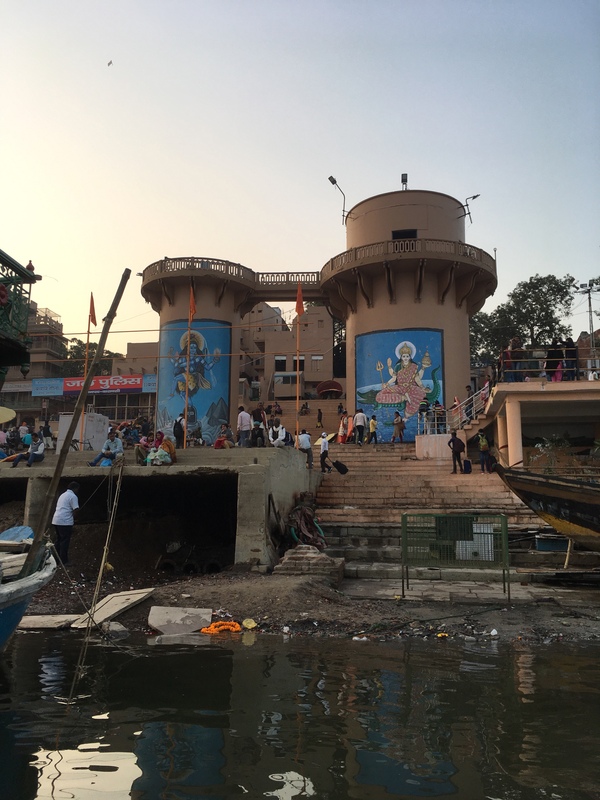 We saw the different ghats, and the Manikarnika Ghat where they burn bodies. 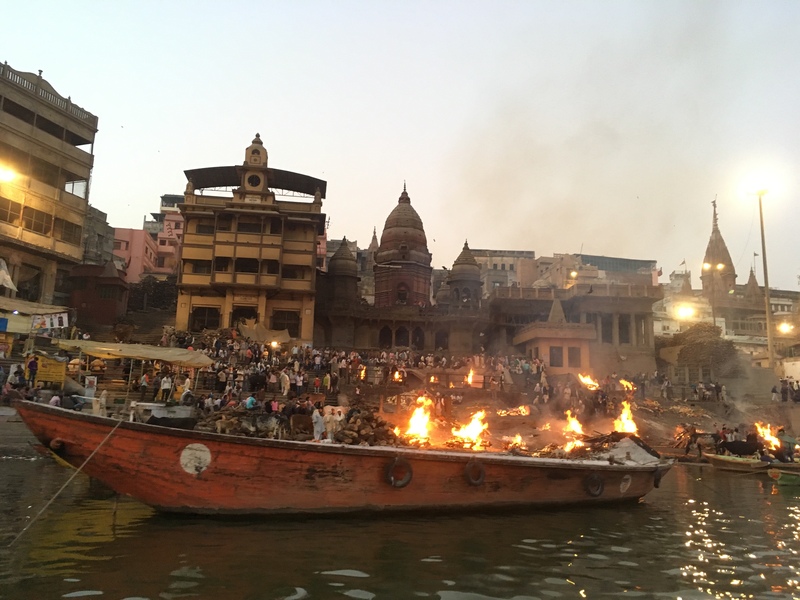 At night time we saw an Aarti ceremony.